In September 2016, Crown & Caliber offered for sale a group of 100 vintage Heuer chronographs, in a sale called “The Heuer 100”. OnTheDash prepared a Guide to the Heuer 100, which was originally published by Crown & Caliber and is re-published below. We are re-publishing this Guide below and hope that it will offer an interesting introduction to the world of vintage Heuer chronographs. Long before it became a chain of “mall stores” for teenagers, Abercrombie & Fitch was a very different style of retailer. The company had only two stores, in New York City and Chicago, and was the supplier of choice for well-heeled gentlemen embarking on adventures. Whether going on a climbing expedition, enjoying an ocean voyage, fly fishing, hunting or motoring, Abercrombie & Fitch offered top-quality gear for the most discerning customers. Beginning in the early 1950s, Abercrombie & Fitch had a unique relationship with Ed. Heuer & Co., calling on the watch company to design and build watches and chronographs to support its clients on their adventures. 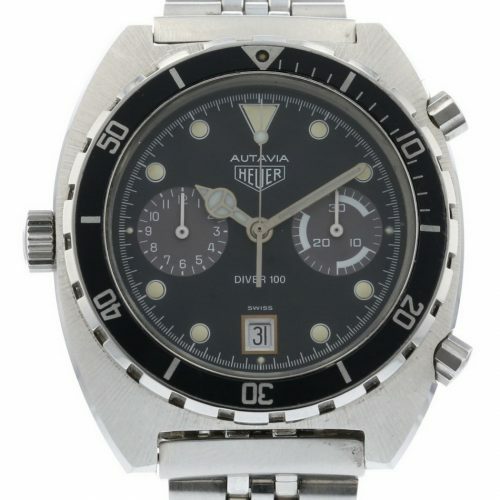 Heuer built rugged chronographs for Abercrombie & Fitch, and the most celebrated was the Seafarer, a unique watch that combined a 12-hour chronograph with a dial (at nine o’clock) to show the high and low tides each day. 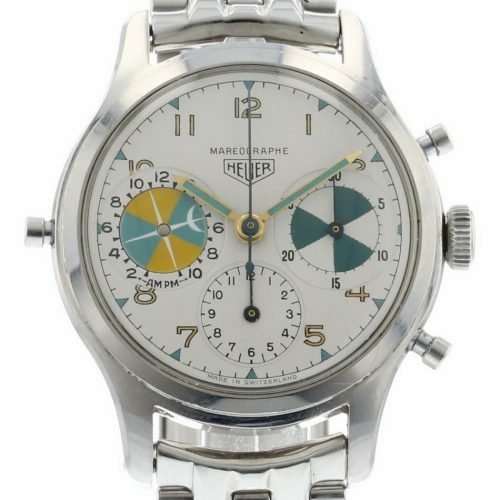 Abercrombie & Fitch sold these colorful chronographs under the Seafarer name, while Heuer sold them as “Mareographes” and also produced them for Orvis, these being sold under the “Solunagraph” model name. The Seafarers were always housed in cases used by other models of Heuer chronographs, including cases for Carreras and Autavias. 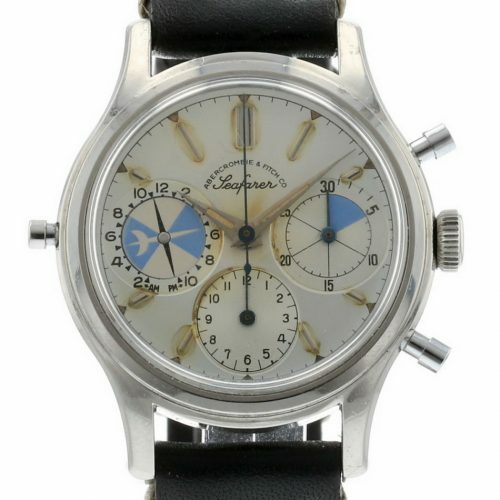 Item 75 is the earliest of the four, a Heuer Mareographe housed in a Reference 2444 chronograph case. The green of the hands is a perfect match to theunique yellow and green of the registers. The community of collectors has probably seen fewer than five of this model. Item 42 is the next progression of the Seafarer – also housed in a Reference 2444 case, but by this time (circa 1960), theyellow and green has given way to a blue and silver color scheme. 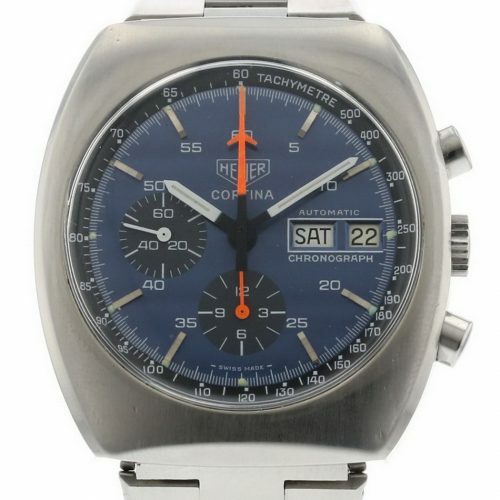 Heuer would use these silver / blue tones for the remaining life of the model. Item 70 is one of the rarest of the vintage Heuers, a Heuer Mareographe in the Reference 2444 case. 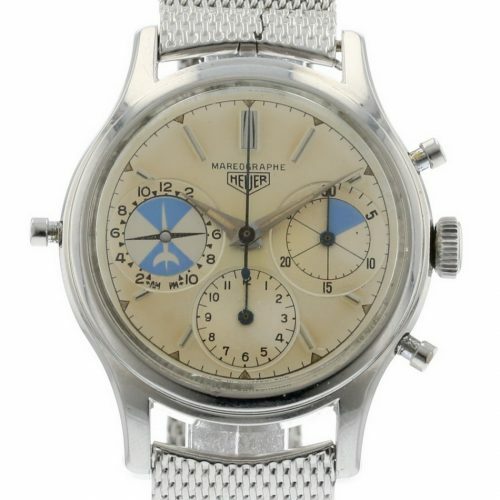 While Heuer produced the Seafarers for Abercrombie& Fitch, actual production of the Heuer-branded Mareographe models probably represents well under ten percent of Seafarer production, and this watch is one of them! Item 83 is the most prized of all the Seafarers. The silver / blue color scheme is carried forward from the second Reference 2444 model, butthe Seafarer is now housed in the Reference 2447 case of the Carrera. Item 30, an Orvis Solunagraph, represents the last generation of the Seafarers. 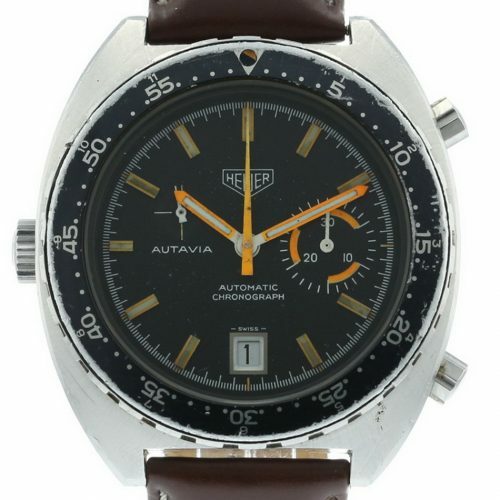 The dial has gone from silver to black and the Solunagraphnow resides in an Autavia Reference 2446C (Compression) case. 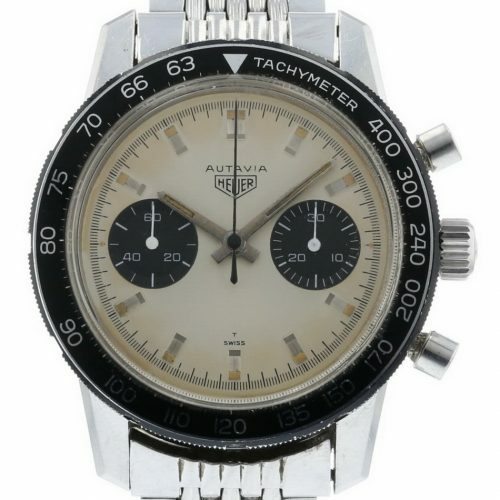 The scale on the tachymeter bezel has been recalibrated from that used on the Autavias, to show the slower speeds that might be achieved on the water. 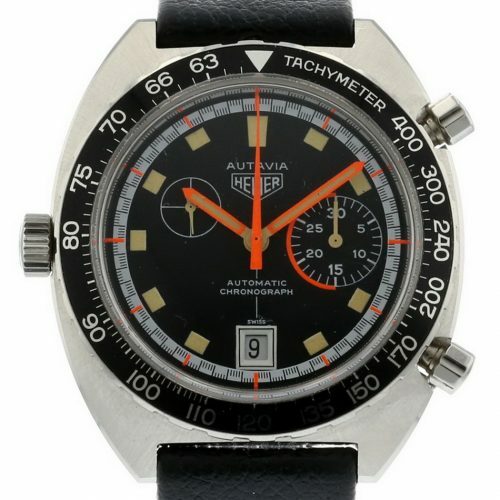 The word “Autavia” combines the words “AUTomobile” and “AVIAtion”, and Heuer had used Autavia as a model name for one of its dashboard timers, from the mid-1930s through the mid-1950s. 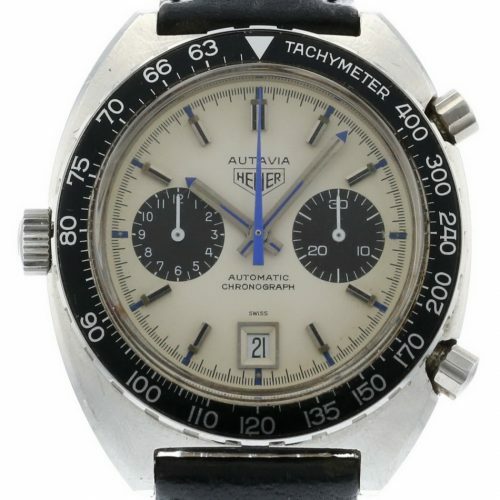 Until the early 1960s, Heuer had used only reference numbers for its chronographs, but in 1962 Heuer decided to use the Autavia name for a line of its chronographs (so the Autavias became the first Heuer chronographs to have model names). The early Autavia chronographs have several defining features — cases are a traditional round shape, dials are black with contrasting white registers (subject to one exception, which we will describe below) and throughout their lives, all the Autavias had rotating bezels. 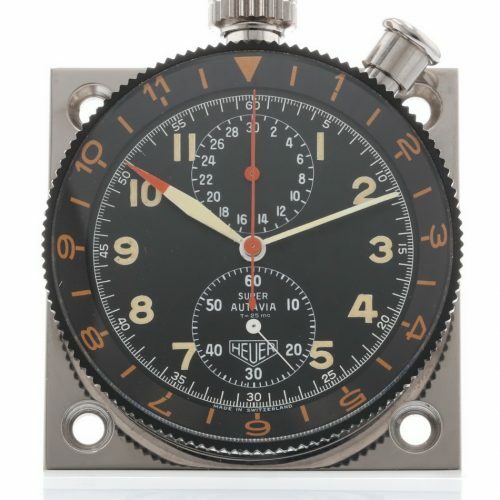 Different inserts in the bezel would have markings for hours, minutes, a second time zone or the computation of speed by a tachymeter scale. As with all chronographs of the 1960s, movements are manual-winding, with a capacity of 30 or 45 minutes (for the two-register models) or 12 hours (for the three register models). All early Autavias are marked, ““Stainless Steel Chronograph – Waterproof – Guaranteed 330 Feet Under Water”. 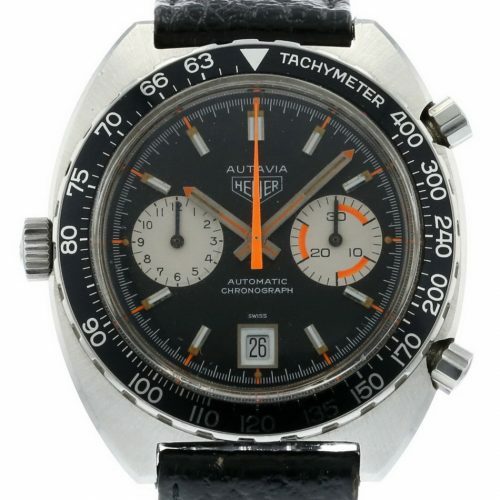 Item 92 is an early two register Autavia (Reference 3646), with a screw-back case, and is distinguished by its oversized registers, known to Heuercollectors as “Big Subs”. These models are coveted by collectors, as they were produced only in the early days of the Autavias. This model has dauphine hands in steel, with a distinctive red hand for the chronograph seconds. Item 57 is the second iteration of the Autavia dial to appear in an early screw-back case, featuring both applied metal markers andluminous dots, at each hour. 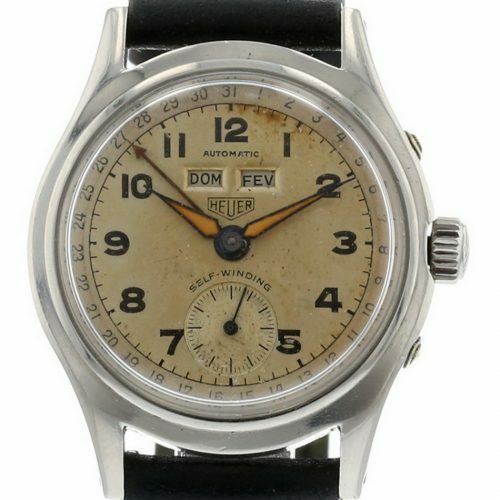 The rotating bezel is interesting, in being marked for hours 13 through 24, and is believed to be authentic. 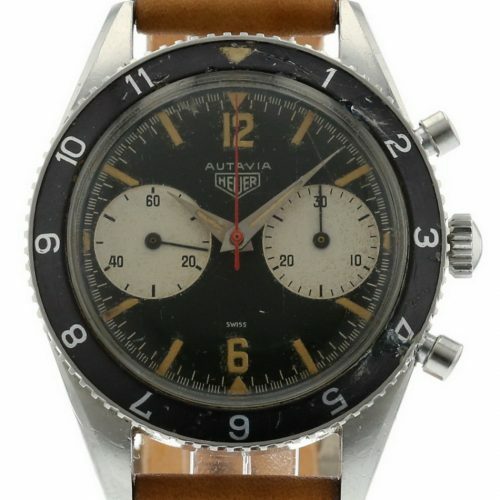 Item 48 is a two-register version of the Autavia (circa 1967), and is the model that was worn by racing hero Mario Andretti, providing thisAutavia with its instant nickname. 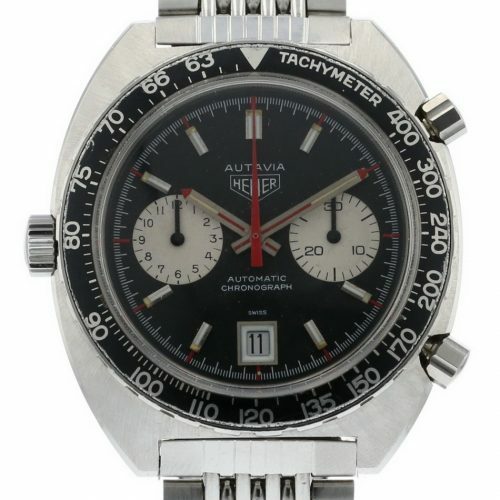 Note the rotating tachymeter bezel, which made its first appearance on this version of the Autavia. 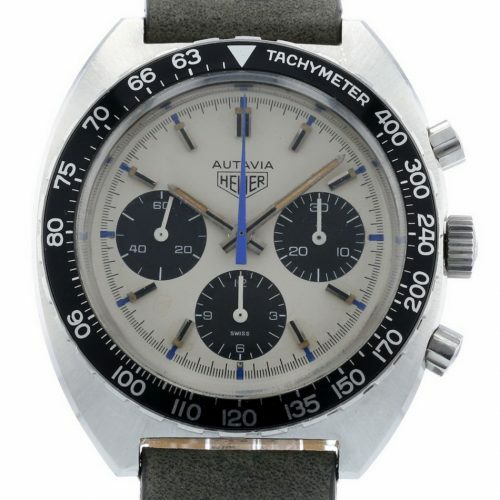 Item 58 is one of the rarest Autavias, continuing the basic style of the second generation Autavia dial, but with the dialnow including a tachymeter scale (giving it the “Tachy on Dial” nickname). Numerals “12” and “6” are also applied metal. 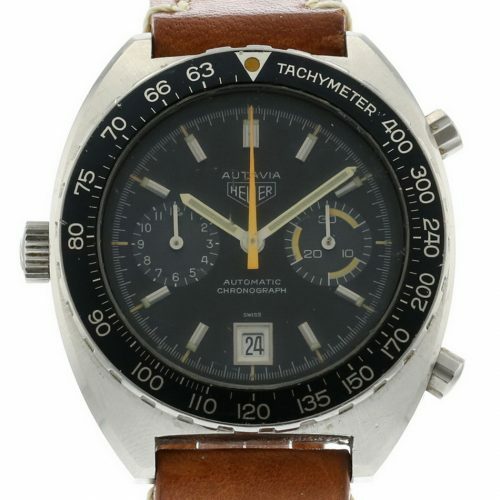 In 1968, Heuer changed the case used for the Autavia from the previous screw-back configuration to a snap-back “compressor” case. Item 33 (Reference 2446C) employs this case, with a rotating tachymeter bezel. 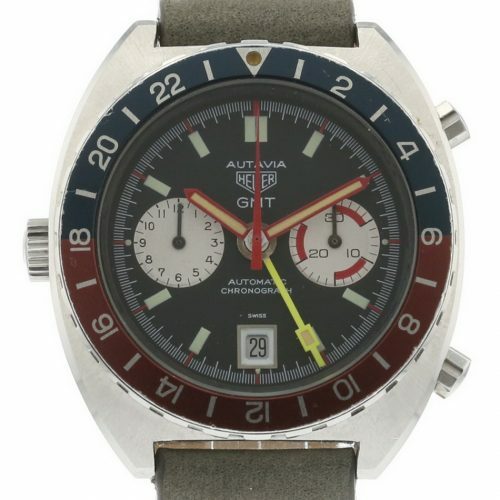 Item 60 is probably the rarest of all the Autavias (Reference 7763 CSN), with a silver dial and contrasting black registers, housed in a standard“compressor” case. These silver dials are thought to have been an early test (circa 1968) for the American market. However,it appears that the silver-dialed Autavias never went into production. The community of collectors has seen fewer than five of this model. Heuer introduced the Carrera in 1963, and the early models are praised for their clean lines, evoking the essence of a chronograph designed for motorsports. The cases are a traditional round shape, and the lugs have a unique geometry not used on any other chronographs. Dials are clean, with the deletion of tachymeter and telemeter scales that cluttered many chronographs from the 1950s. Two versions of the Carrera offer calendars, the Carrera 45 Dato incorporates a date window into a chronograph with 45-minute capacity and the Carrera 12 Dato displays the day, date and month, with a full three register chronograph (12-hour capacity). 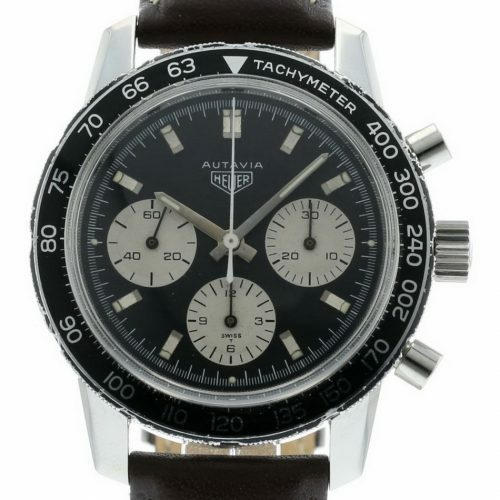 Item 19 is a Reference 3647 N Carrera, a two register chronograph with a black dial and registers, and a 45-minute recorder. The thin hands and markersare the hallmarks of the earliest Carreras. 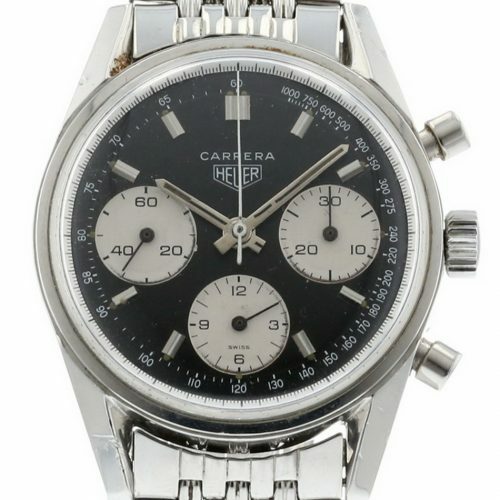 Item 99 is a Reference 3647 T Carrera, a two register chronograph with a silver black dial and registers, and a red tachymeter scale on the dial. Thetachymeter scale is associated with racing, allowing the user to convert elapsed time over a measured mile into miles per hour. Item 97 is a Reference 2447 D Carrera, a three register chronograph (12-hour capacity) with a decimal minute’s scale on the dial. The decimal minutesscale displays hundredths of minutes (rather than seconds), as these units are used in rally instructions and they allow for easier computations. 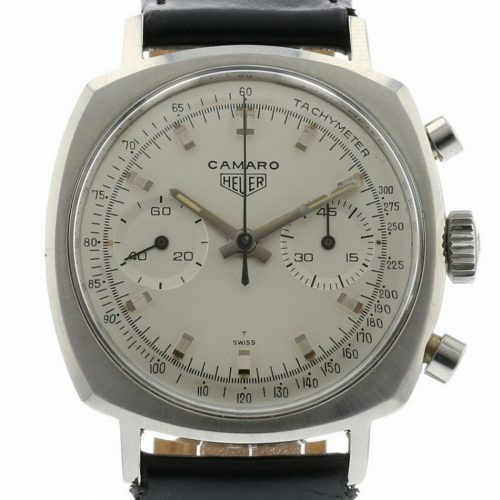 Item 82 is a Reference 2447 NST Carrera, a three register chronograph, featuring a black dial, white registers and a tachymeter scale on the dial.This model was introduced in the late 1960s. 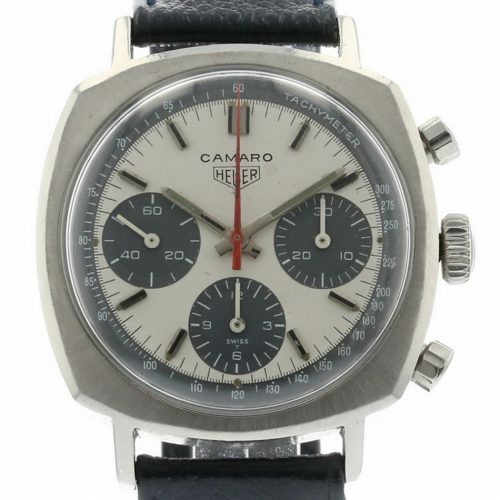 Item 23 and Item 24 are Carrera 45 Datos, one with a black dial and white registerand the other with a silver dial and matching silver register. These Datos are circa 1968 and are the first chronographs to use a window and disc to display the date. They are powered by the Landeron 189 movement. Item 74 is the Carrera 12 Dato, which some consider to be the ultimate Carrera. Powered by the Valjoux 72C, the Carrera 12 Dato combines a triplecalendar complication (day / date / month) with a three register chronograph (12-hour capacity). The case employs monocoque construction, rather than the usual screw-back, so the movement is accessed by removing the crystal. 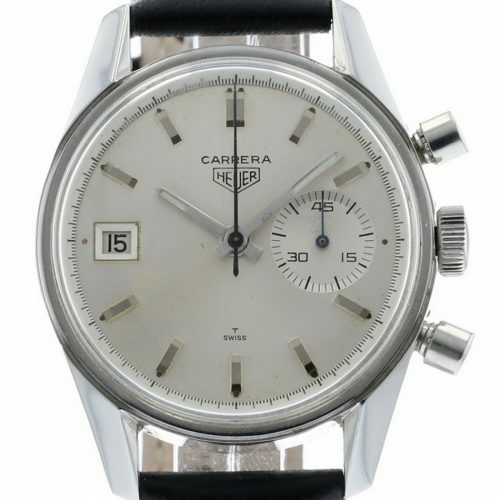 The Carrera 12 Dato is one of the rarest of the vintage Heuers. 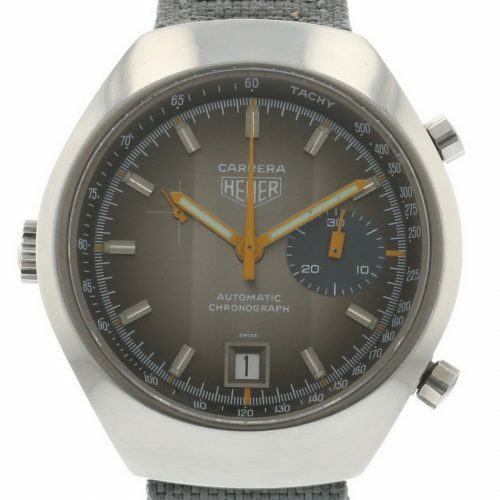 The vintage Heuer enthusiasts sometimes refer to the “Big Three” of Heuer’s chronographs – the Autavia, Carrera, and Monaco – but recently the Camaro has moved to the top of the list of hot Heuers. The Camaro was introduced in 1967, being named for the Chevrolet sports car then enjoying great popularity in the United States. Indeed, the Camaro was the pace car for the Indianapolis 500 in 1967 and 1969. Over the next few years, Heuer produced almost 50 different versions of the Camaro, all using the same cushion-shaped case and all being powered by manual-wind Valjoux movements. The Camaros provide a nice transition between the classic models from the early 1960s (Autavia and Carrera) to the wilder models that Heuer would introduce in the 1970s (Monaco, Silverstone, and Montreal, for example). Item 64 is an early model – the Camaro 45 — powered by the Valjoux 92 movement. This Reference 9220 T model has a white dial, with a tachymeterscale, and the plain polished markers and hands confirm its early vintage. Item 76 is a Camaro 45 with a black dial and a tachymeter scale on the dial. 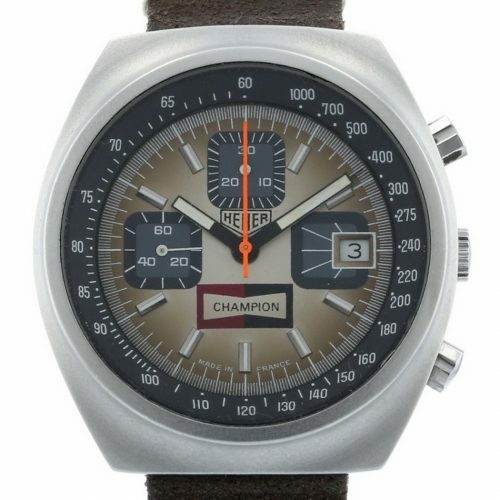 This watch was presented to each class winner in the 1967American Road Race of Champions, the national championship of amateur sports car racing. The black dial has aged to a warm chocolate tone. Item 69 represents the next generation of Camaro, known to collectors as the “exotics”. This three-register exotic (Reference 7220) has a silver dial, withcontrasting chronograph registers and the tachymeter track in charcoal. There were three primary cases for the automatic Autavias. First was the Reference 1163 case, which used a plastic crystal. 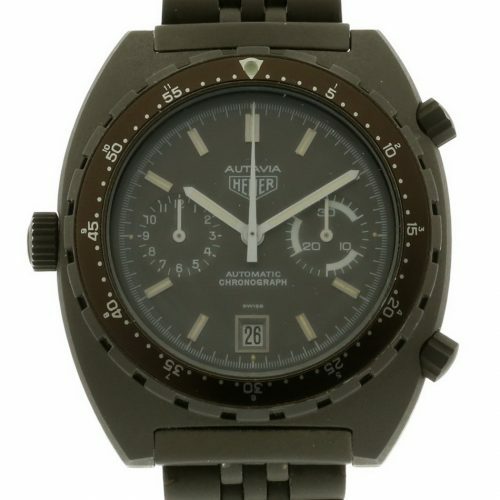 In 1972, Heuer increased the size of the automatic Autavia cases, in order to equip them with a mineral crystal. The telltale of the new Reference 11630 case is a deep inner flange, providing clearance for this crystal. 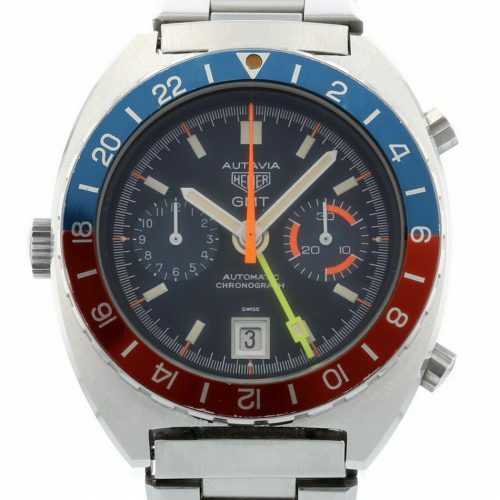 The last of the Autavias, produced starting in 1984, used an even larger case (Reference 11063), measuring 42.7 millimeters across the dial and 21 millimeters between the lugs. Item 18 is the Reference 1163 MH Autavia (circa 1970), the black-dialed companion to the white-dialed “Siffert”models, described below. The bezel of this chronograph is marked in minutes and hours; the hands are polished steel; and the hour recorder is marked with numerals 3, 6, 9 and 12. 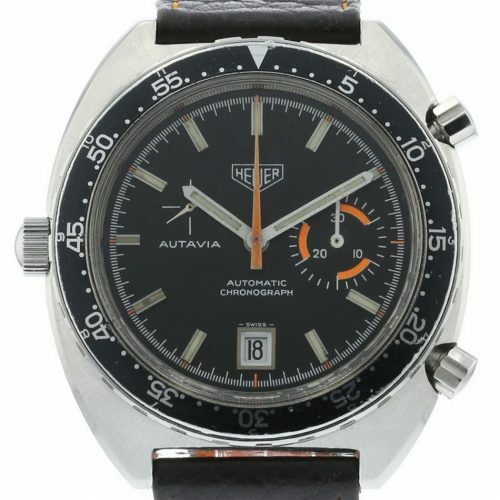 Item 9 is the Reference 1163 “Viceroy” Autavia, so called because it was offered for $88(in 1972), as part of a promotion by the Viceroy cigarette brand, at a time when the 1163 MH model (described above) was selling for $200 at retail. Features of the “Viceroy” that differentiate it from the standard model are the tachymeter bezel, brushed steel hands, and numerals 1 through 12 on the hour recorder. Item 54 is the one collectors call the “Orange Boy”. Physically, the watch is almost identical to the “Viceroy” exceptthat the red accents of the Viceroy are orange in the “Orange Boy”, and the orange stripes are added to the hour recorder. 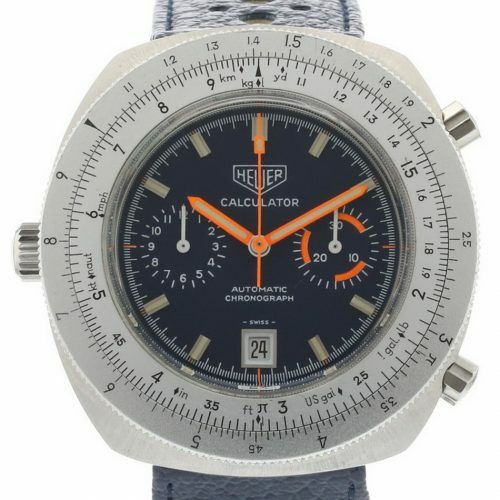 The Viceroy is probably the most common of all the vintage Heuers, while the Orange Boy is one of the very rarest. 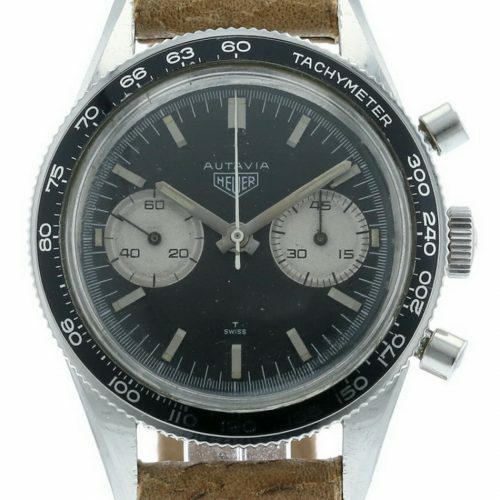 Item 89 shows an entirely new look that Heuer offered for the Autavia, in 1972. The Reference 11630 case is deeper than the previous 1163case, and accommodates a mineral crystal in place of the previous plastic. The color scheme is also new — a metallic, brushed silver dial, black registers, and orange accents on dial and hands. 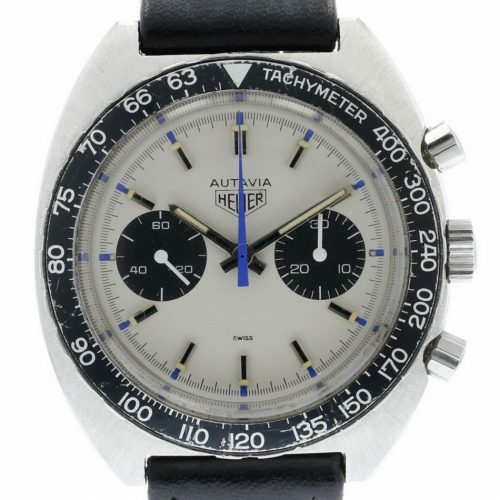 Item 28 is the second Reference 11630 included in the Heuer 100, and brings another new look to the Autavia range. It features ablack dial, dark charcoal registers, and orange accents and hands. This would be a favorite color combination for future Autavias. Item 44 is the Diver 100, one of the most distinctive of the Caliber 12 Autavias. The Diver 100 has round luminous markers, a Mercedes hour hand,and a dive bezel, marked in minutes (1 through 15), then every five minutes. The Reference 11630 case has a unidirectional bezel, so that the diver cannot inadvertently add time to the dive. Item 78 is another Diver 100, except that this one has the special “Decompression” bezel for the diver. This bezel is marked inmeters, so that when the red triangle is set to the position of the minute hand, the numbers on the bezel inform the diver of the amount of time (“bottom time”) that can safely be spent at a specific depth. Item 45 is a black-coated version of the Reference 11063 case (Reference 113.603), with the black dial and charcoal registers also offering amilitary look. These models were in fact issued to a special naval unit of the Israel Defense Forces. These were the last of the Autavias, introduced in 1985. 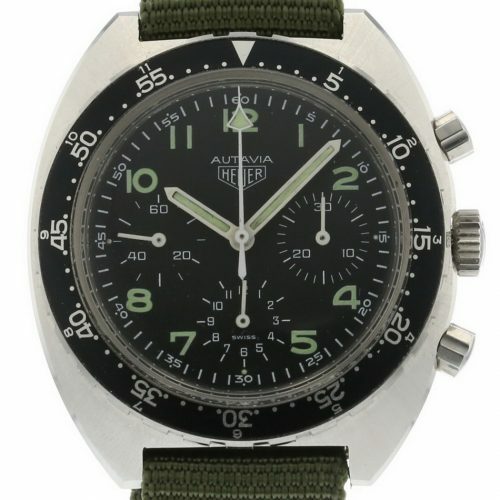 Item 95 is the military green (olive drab) version of the Reference 11063 case (Reference 111.603). The dial, registers and bezelall match the green of the case. This one is on the original bracelet, also coated in military green. 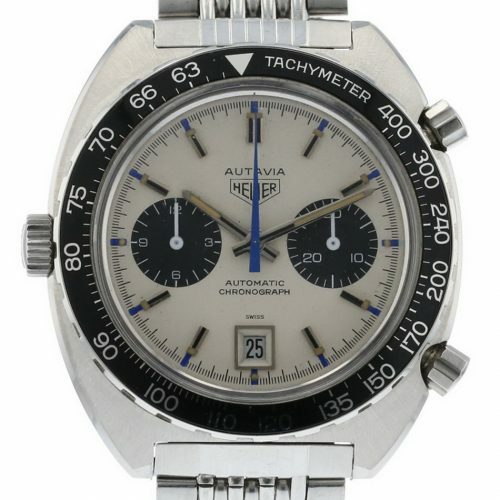 The Autavia was one of the first automatic chronographs on the market, but its high price (over $200 by 1972) and market conditions made it difficult to sell. 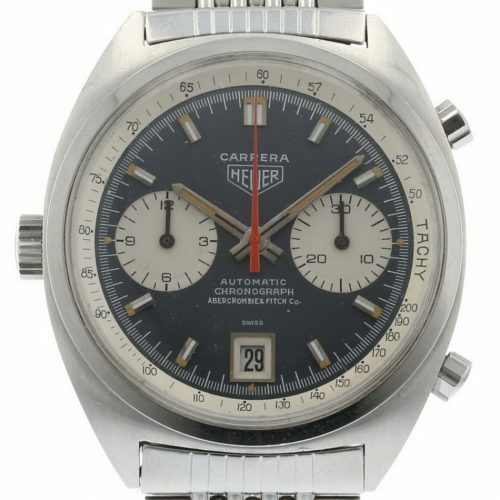 In 1972, Heuer sought to boost its sales by reducing the price of its automatic chronographs. The key to this initiative was the development of the Caliber 15 movement. In the Caliber 15 movement, the 12-hour recorder was deleted, a brass balance wheel replaced the Glucydur wheel, the KIF shock protection system replaced the Inacbloc system, and the Isochron micro regulation system was deleted. 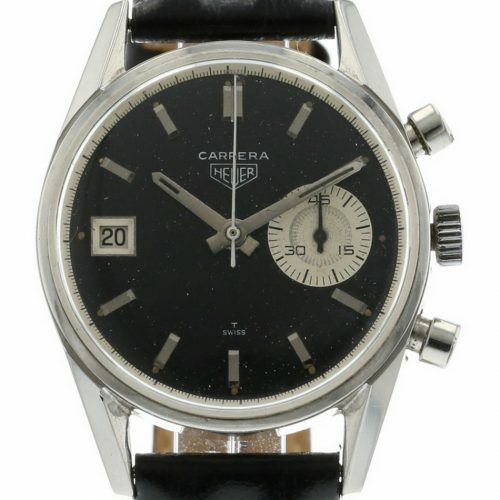 As a result of these changes, Heuer was able to sell the Caliber 15 Autavias for $185. Line up all 88 versions of the Autavia that Heuer offered from 1962 through 1984, and most observers would agree that one of them looks very different from all the others – the Caliber 15 Exotic (Item 56). Start with the asymmetry of the Caliber 15, add large lume markers and a vivid orange semi-circle, and then finish it with checkerboard stylehash-marks. Yes, this one is different from the other 87!! 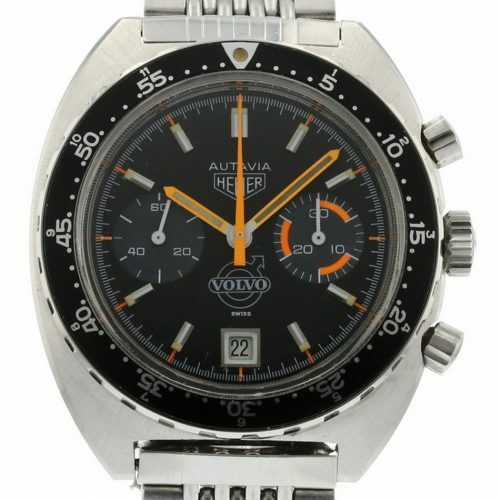 Item 25 is the Reference 1563 Autavia, with a black dial and registers, and orange accents. Item 6 is the Reference 15630 Autavia, a rare model that incorporates the Caliber 15 configuration into the second generation automatic Autavia case(with its mineral crystal in place of the previous plastic crystal). 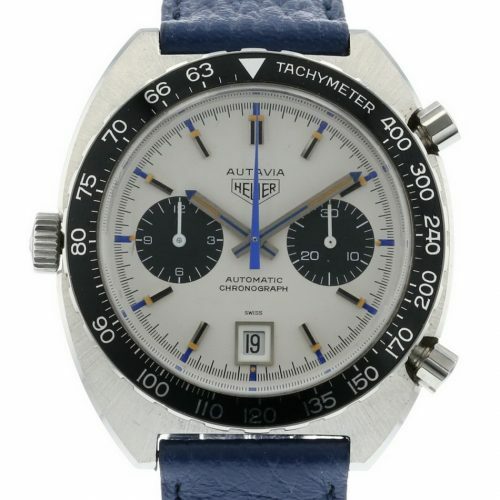 Heuer introduced its line-up of automatic chronograph in 1969, and the Autavia received not only its first automatic movement but also an entirely new color scheme. The black dials of the 1960s gave way to an entirely new look – white dials, black registers, blue accents and a rotating Tachymeter bezel. Swiss Formula One hero Jo Siffert wore this model, and the entire line-up of these white-dialed models are now known as the “Siffert” Autavias. 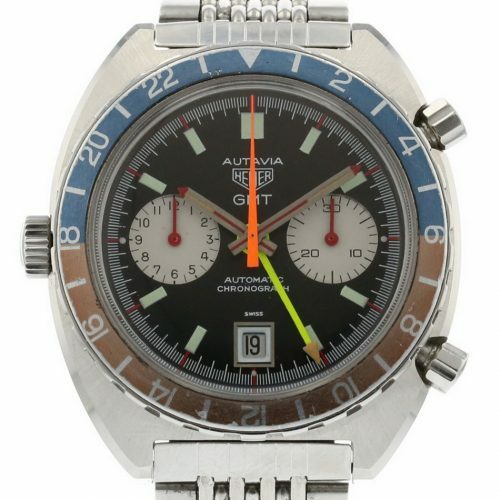 Over the period from 1969 through the mid-1970s, Heuer produced at least six versions of the automatic “Sifferts”, with an array of manual-winding models to complete the line-up. 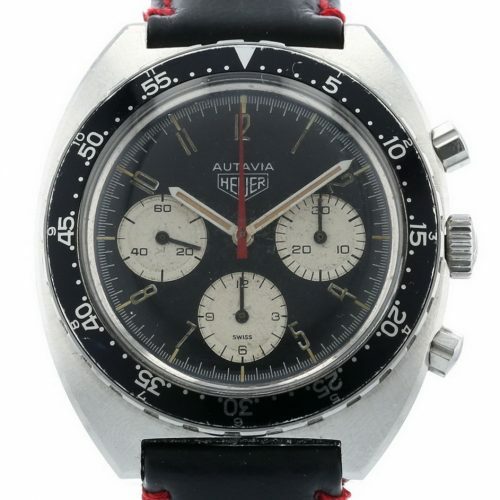 Item 52 is the Mark 4 version of the “Siffert” Autavia, with numerals 3-6-9-12 on the hour recorder, and polished steel hands withblack and luminous inserts. 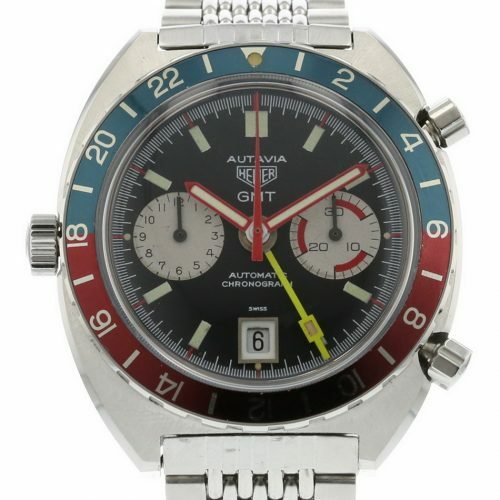 Item 46 is the Mark 5 version of the “Siffert” Autavia. The hour recorder retains the 3-6-9-12 numerals for the hours, but thehands are now brushed steel, with blue inserts to match the triangular blue tips. Item 88 is the last version of the “Siffert” automatic Autavia, and is recognizable by its brushed steel hands with triangularblue tips and the 12 numerals on the hour recorder. 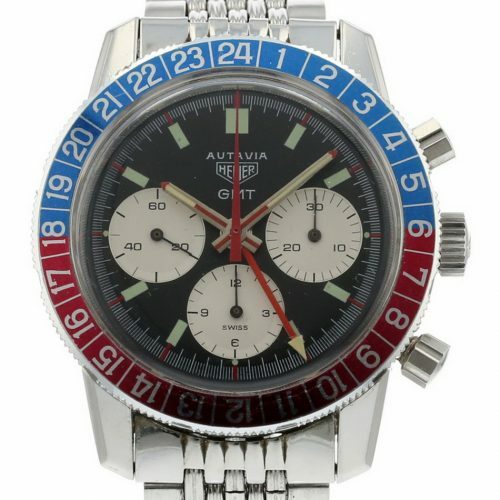 Collectors refer to this one as the “Mark 6” Siffert Autavia. 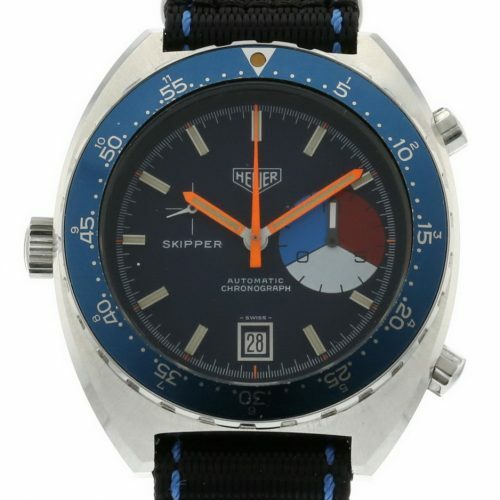 There are three manual-wind “Sifferts” in the Heuer 100. These three models provide the same style and colors as the automatic “Siffert” models, with different configurations of registers and the date / no date feature.Item 40 is a two-register version (Reference 73363), Item 37 is a two-register version with a date at six o’clock (Reference 73463), and Item 41 is a three-register version, offering 12-hour chronograph capacity (Reference 73663). Heuer introduced its automatic chronographs in 1969, but continued to offer manual-winding chronographs, throughout the 1970s. The 1970s Autavias did, however, make the transition to the new C-shaped case that had been designed to accommodate the automatic movements. Color schemes and accents tended to correspond to the automatic models, with some of the manual models being thinner, in view of the thinner movements. 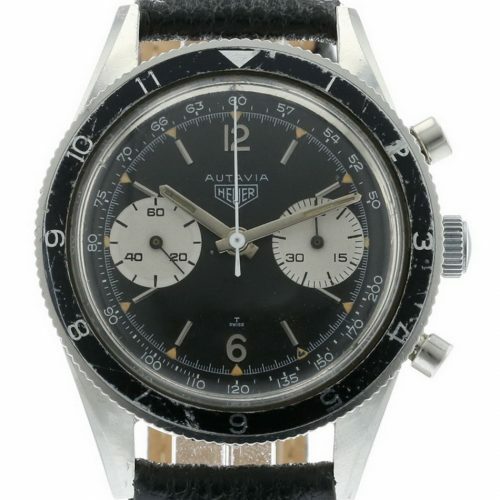 Item 49 is one of the rare Autavias that has Arabic numerals in a radial pattern (as if extending out from the center of the dial).Collectors refer to an Autavia with this style of numerals as a “Shauntavia”, as these models were popularized and documented by a collector in the U.K., named Shaun. This is the three-register version, with 12-hour chronograph capacity. Item 77 is another “Shauntavia” (Reference 741.603), except that this model has two registers and a date window at six o’clock, withdistinctive pencil-shaped hands. This model has no running seconds register, as the two registers are for the hours and minutes. The “KAF” marking on the case-back indicate that this Autavia was issued by the Kenya Air Force. 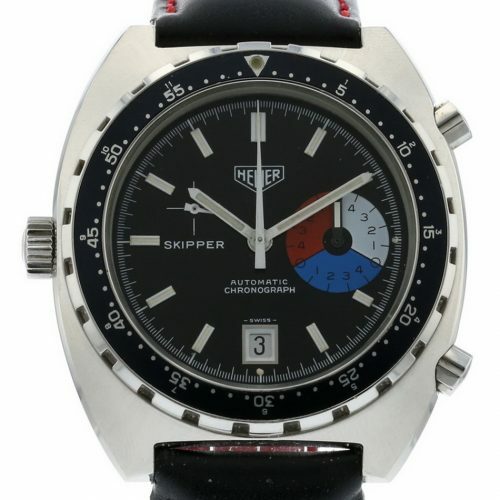 Over the years, Heuer chronographs were used as promotional items for many automotive and motorsports brands. 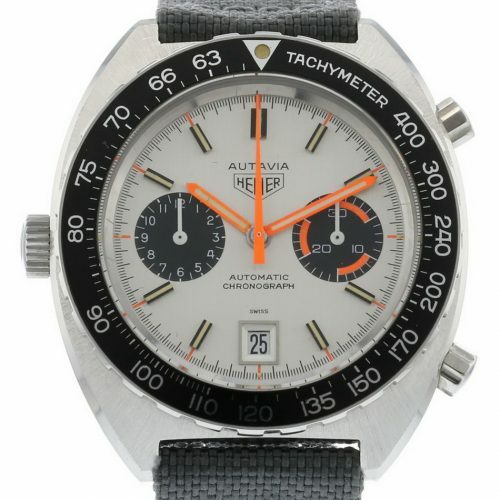 Item 85 is a manual-wind Autavia (Reference 73463) with the Volvo logo at the bottom of the dial. While many of the manual-wind Autavias mimic the design of their automatic counterparts, the Reference 73663 “Bund” (Item 50) offers a style that is unique to this manual-wind model. The numerals follow the style of Heuer’s iconic Bundeswehr chronograph, and the end of the chronograph second hand has the delta wing shape, offering the pilot optimal visibility. First introduced around 1968, the Autavia GMT chronographs combine a two or three register chronograph (in either case, with 12-hour capacity) with a colorful red and blue bezel that is rotated so that an additional hour hand will track the time in a second time zone. 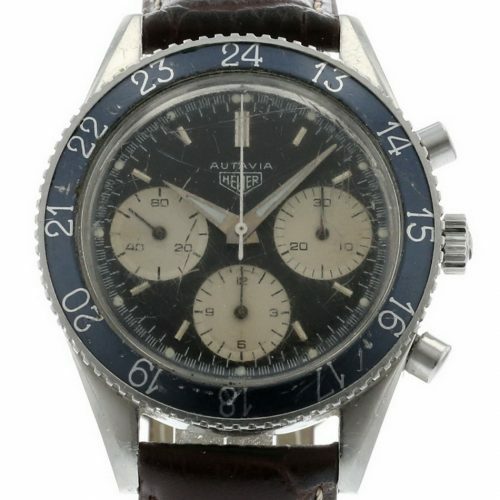 These GMT models resided in standard Autavia cases, however, the movements were modified to allow for the extra hand. 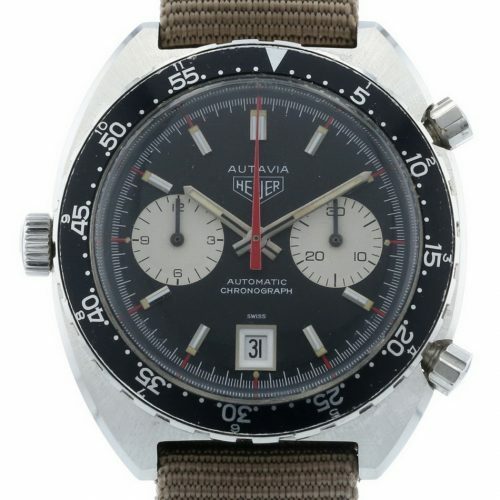 Heuer marketed the Autavia GMT chronographs to pilots and travelers, producing almost a dozen models over the life of the Autavias. 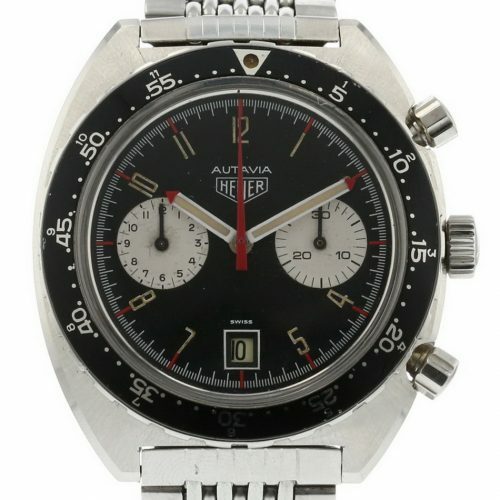 Item 47 is a manual-winding Autavia GMT chronograph from the late 1960s or early 1970s, and is powered by a modified version of the Valjoux 72movement. The case is the Reference 2446C (compression case) used on standard Autavias. Item 96 and Item 90 represent two executions of the firstgeneration of automatic GMT Autavias, which were housed in the Reference 1163 case. Item 96 is the second execution Reference 1163 GMT, with brushed steel hands, while Item 90 is the third generation model, with red-edged hands and red stripes on the minute recorder. Item 38 and Item 39 are Reference11630 Autavia GMTs. Item 39 is the earlier version, which continues the style of dial and hands from the last execution of the 1163 GMT, but is now housed in the larger case with its mineral crystal. 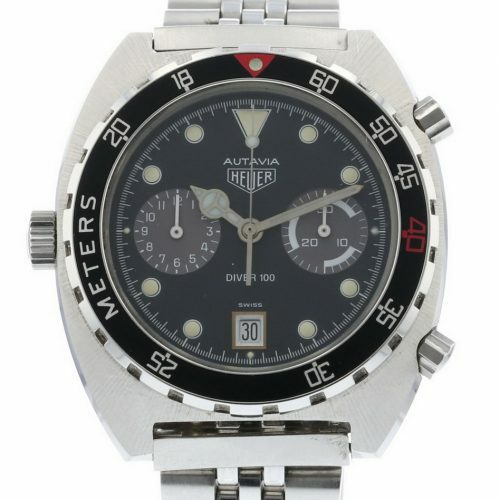 Item 38 is the later version of the 11630 Autavia GMT, and has dark gray registers, rather than the white registers of all earlier models. 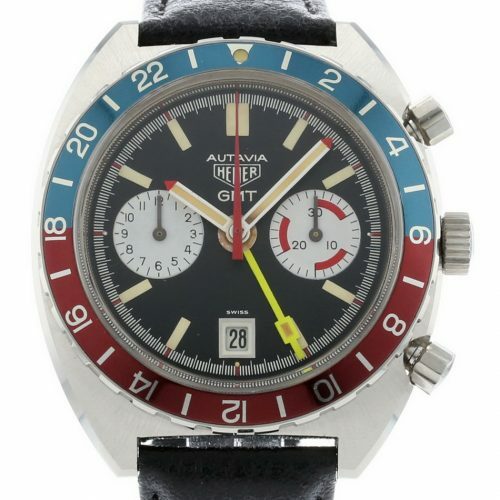 Item 91 is the GMT that resides in the last of the Autavia cases, the Reference 11063. This is the largest of the Autavias, with the distance betweenthe lugs increasing from 20 to 21 millimeters. Item 94 is one of the rarest of the Autavias, a manual-wind Autavia GMT, in a 1970s style Autavia case (Reference 741.603 GMT). The main time of day hands are a wide pencil shape, with full luminous inserts and triangular red tips. Like the Autavia, in 1969 the Carrera received an entirely new case, to house its new automatic movement. And also like the Carrera, this new case was a C-shaped case, that broke from the traditional style of the 1960s Carrera cases. 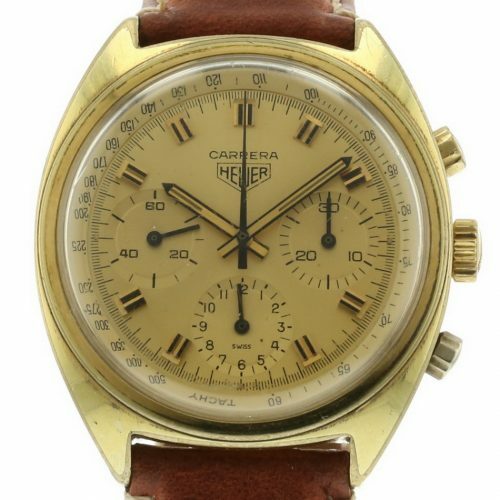 Heuer would offer a broad variety of automatic and manual-wind Carreras in the 1970s, using stainless steel cases, as well as 18 karat gold and gold-plated cases. 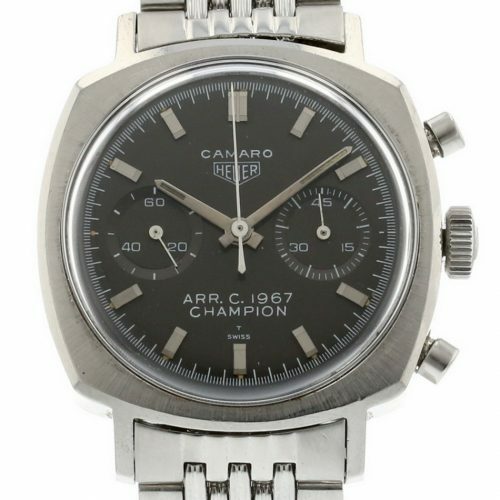 Item 73 is a Reference 1153 N Carrera, one of the earliest versions of the automatic Carrera, with a charcoal gray dial, and white for the registersand inner bezel. The polished steel hands mark this as an early execution of the automatic Carrera. 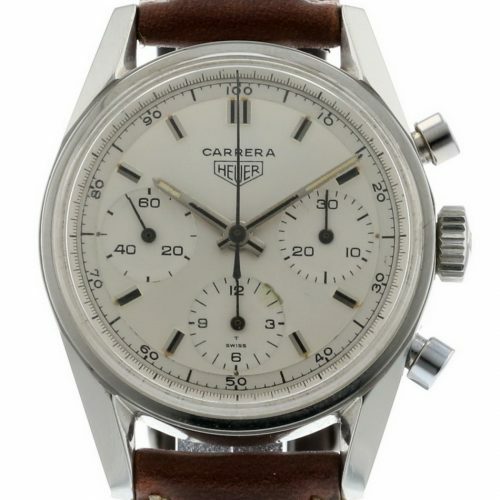 This Carrera was made by Heuer for Abercrombie & Fitch, as shown by the logo across the bottom of the dial. Item 100 is a Reference 1153 S version of the Carrera, with a silver dial and contrasting charcoal registers and inner bezel. The hands appear to have been replaced with the later, wider hands. 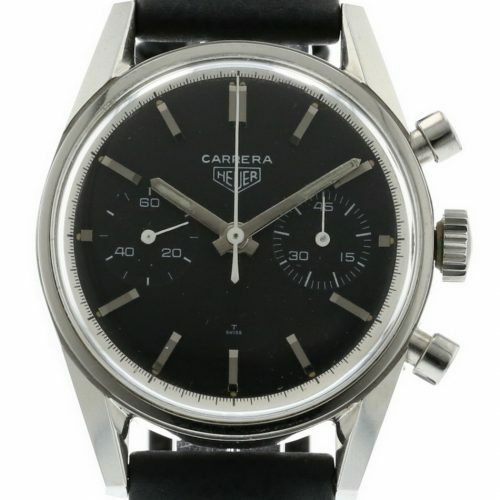 Item 16 is the Reference 110.253 Carrera, the last version of the Carrera to reside in the 1970s style case. The dial has a luminous starburst finishand the hands have black edges and full-length lume. 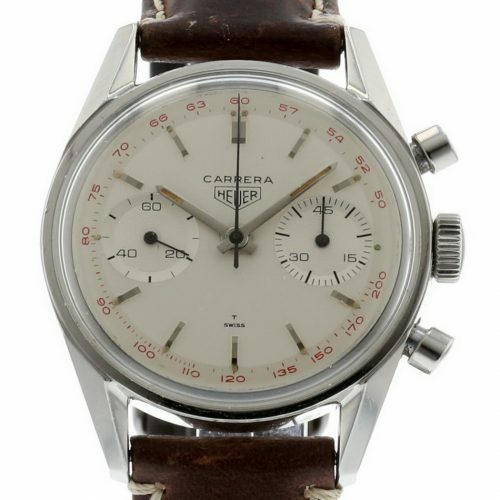 The name “Carrera” is narrower than on other models and does not extend beyond the Heuer shield. Item 5 is a Reference 73655 Carrera with a gold-plated case and a champagne dial and inner bezel. This is the second execution of this model, and has the“double-wide” markers on the dial. The hands have black edges, with brushed gold and luminous inserts. Item 13 is one of the barrel-shaped Carreras, introduced in 1974. This model has the smoke (fume) dial, with orange-edged hands and accents. Cotes de Genève dial is divided into three panels, to reflect light in different ways, while the oval register and off-center running seconds hand adds to the funky 1970s look. 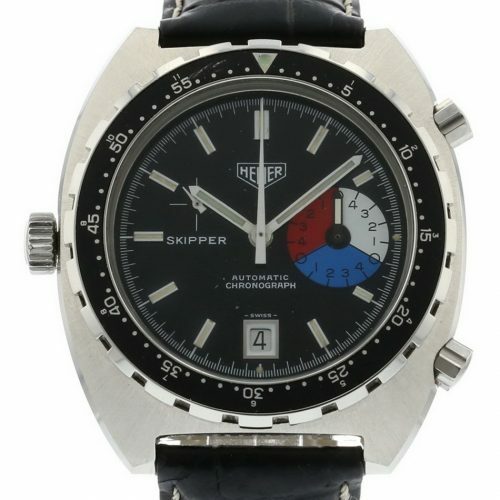 The Skipper was a chronograph designed by Heuer to allow yachtsmen to time the start of a race. Special gearing modified the chronograph minute recorder so that it indicated a 15-minute countdown to the start of the regatta, rather than the standard 30 minutes. Three five-minute segments, marked in red, white and blue, corresponded to the three horns sounded by race officials, to prepare for the start of the race. The first Skipper, introduced in the mid-1960s, was housed in a Carrera case, but the Skipper soon made the move to the Autavia case, which offered improved waterproofing for action on the water. Item 43 is the Reference 73464 Skipper, a manual-wind model, with a midnight blue dial and orange accents and hands. Item 20 and Item 26 are the Reference 15640 Skippers, an automaticmodel with a larger case that uses a mineral crystal. Item 26 is the earlier model, and continues the earlier midnight blue dial and bezel. 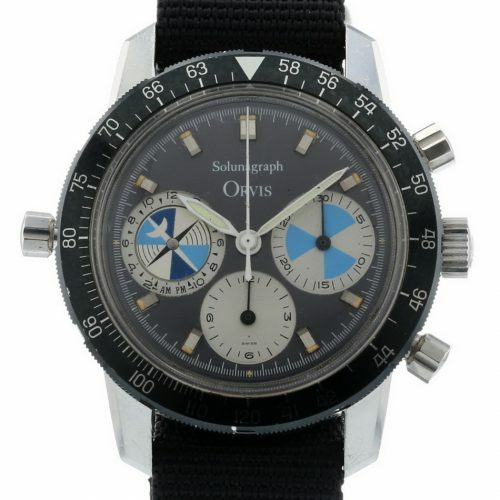 Item 20 is the later model, with both the dial and the bezel switching from blue to black. Item 21 is the last of the Skippers, the Reference 15640, an automatic model with a black dial and bezel, and brightwhite hands and accents. This is also the largest of the Skippers, with the case measuring 42.5 millimeters across the dial. 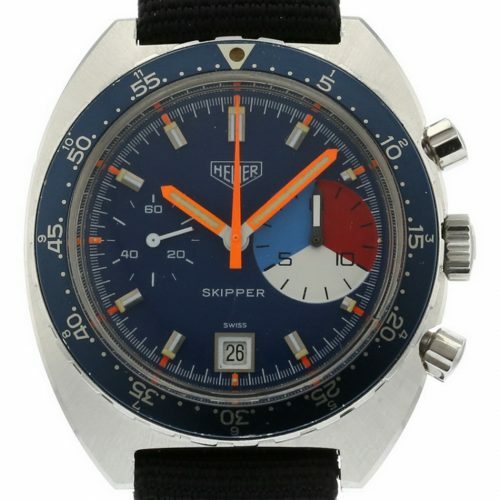 The Skippers use a conventional chronograph configuration to provide the countdown to the start of a regatta, but from the mid-1960s, Heuer had offered a very type of display ideally suited to time the five-minute intervals before the start of a yacht race. These “Regatta” models used a series of five “balls” across the top of the dial, that appeared to change colors every minute, to mark the countdown. 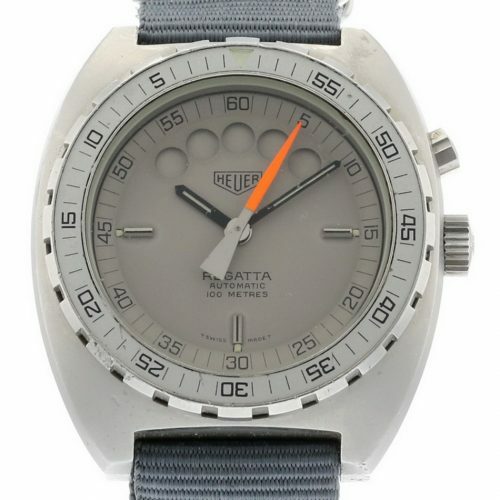 The first two series of Regattas, introduced in the mid-1960s and 1970s, used conventional stainless steel cases. Around 1983, the Regatta took on an entirely new look, with the introduction of the 134.600 Series. This new version of the Regatta borrowed its case from the last and largest of the Autavias (Reference 11063), that was waterproof to 100 meters, with a mineral crystal. The dials are gray, black or military green, with matching cases, bezels, crowns and pushers. Item 10 is the pewter (gray) version of the Regatta, Reference 134.603. The main time-of-day hands are black, with full luminous inserts. 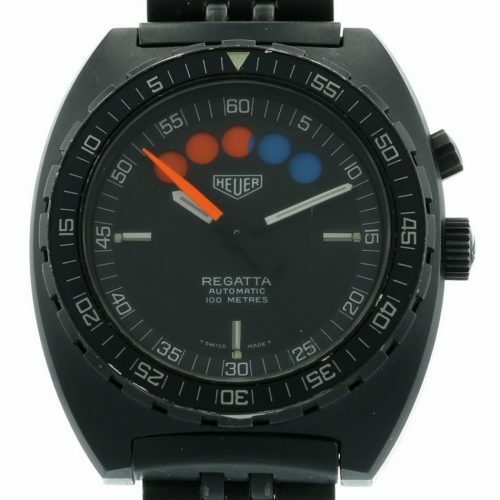 Item 17 is the black version of the Regatta, Reference 134.601, with a matching steel bracelet. The main hands are white, with full luminous inserts. When Heuer introduced its line-up of automatic chronographs in 1969, two of the new automatic chronographs – the Autavia and the Carrera – were carried forward from existing models, although each received a new, larger case to house the automatic movement. 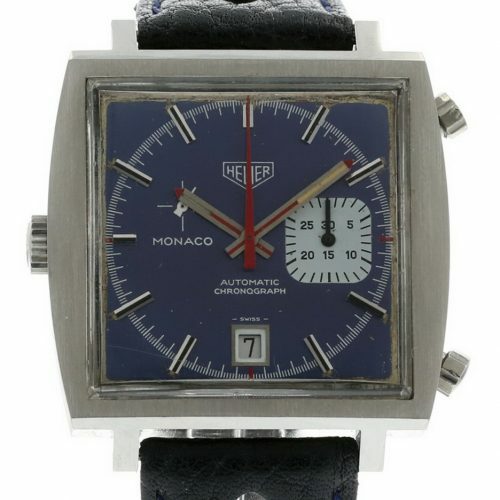 The Monaco was the third member of the automatic line-up, but its design represented a radical departure from anything that Heuer had previously offered (or, for that matter, anything that any other brand had offered previously). The Monaco used a square, waterproof case, with the front piece of the case being held to the back of the case by internal clips. 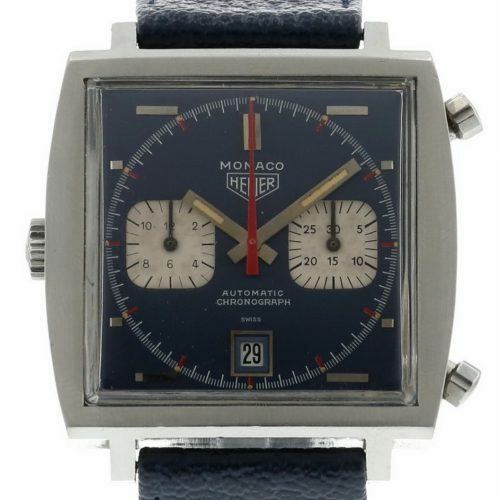 Over its life, the Monaco appeared with blue, silver, gray and black dials, powered by automatic and manual movements. The early Monaco chronographs had a distinctive midnight blue paint, with a brushed metallic finish, and polished steel hands with squared tips. The so-called “Transitional” Monaco (Item 59) has these elements from the very first “Chronomatic” Monacos, and was produced for a short period, before the standard productionmodels. 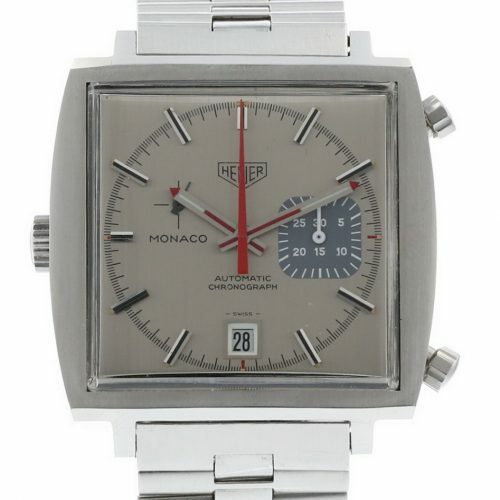 Item 55 is the classic model that we think of when we think of a Heuer Monaco. Worn by Steve McQueen in the film Le Mans, this version of the Monacohas midnight blue paint (in a matte finish), and the hands are brushed steel with red accents and tips. Item 31 maintains the classic McQueen color scheme, but uses a manual movement and a traditional three-register layout (with running seconds at nineo’clock). Item 14 is the fourth blue Monaco in the line-up, this one powered by the Caliber 15 movement, with its 30-minute capacity and asymmetrical runningseconds register. Introduced in 1972, these models return to the metallic blue finish of the earliest models. 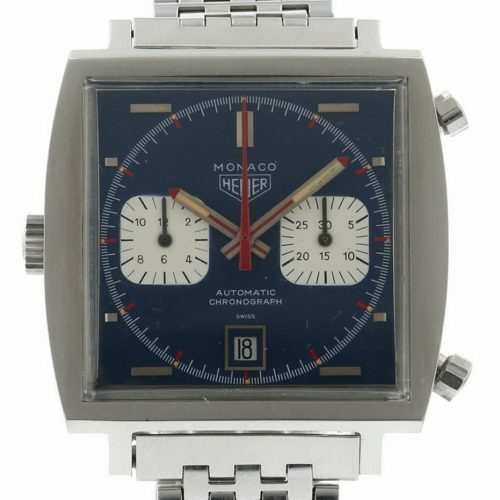 With Item 53, we see the standard blue and white color scheme of the “McQueen” Monaco switch to a charcoal gray dial with charcoal gray registers. As withthe McQueen models, the movement is the Caliber 12 automatic. 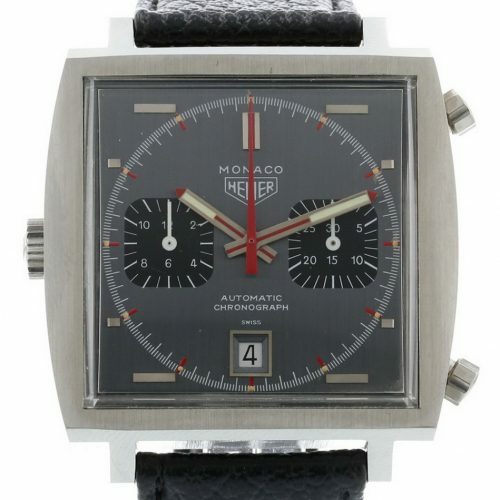 Item 51 is a three-register, manual version of the Monaco, with a gray dial and charcoal registers. Item 36 is another Caliber 15 version of the Monaco, with the dial having a metallic silver finish. This is the only version of the Monaco that usesthis color for the dial. 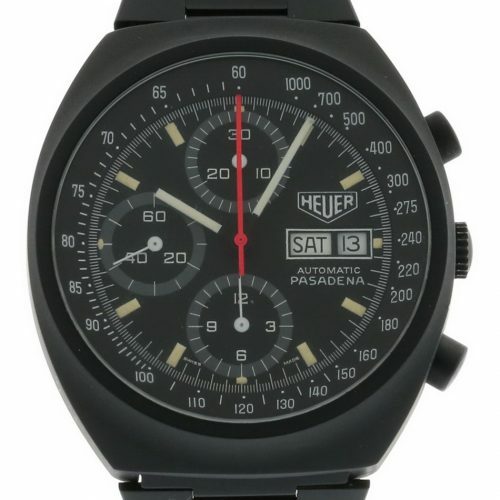 Item 61 is one of the rarest of the vintage Heuer chronographs, a manual wind Monaco in a black PVD case. 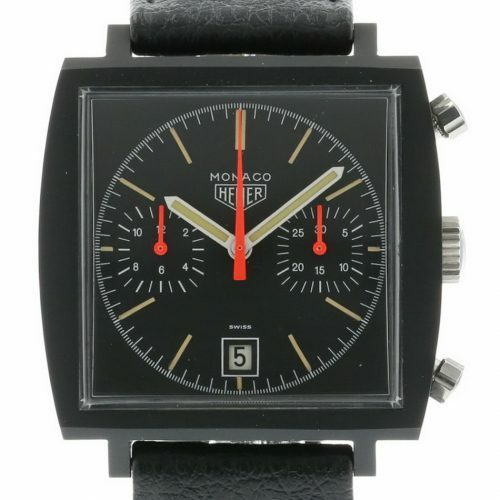 This was the last version of the Monaco produced by Heuer (circa 1975), in an attempt to boost sales through the use of the “military” look that was then becoming popular. 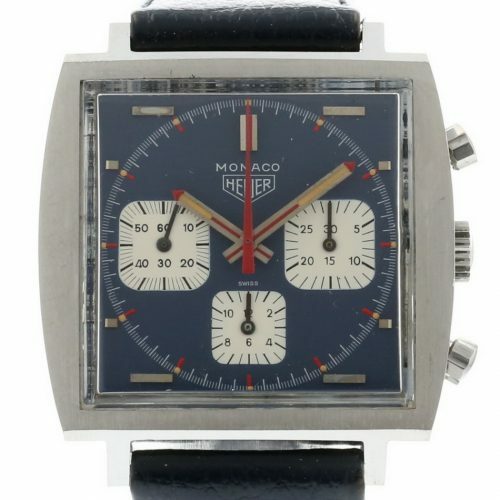 This version of the Monaco never appeared in a Heuer catalog, and appears not to have gone into full production, but they are coveted by today’s collectors. 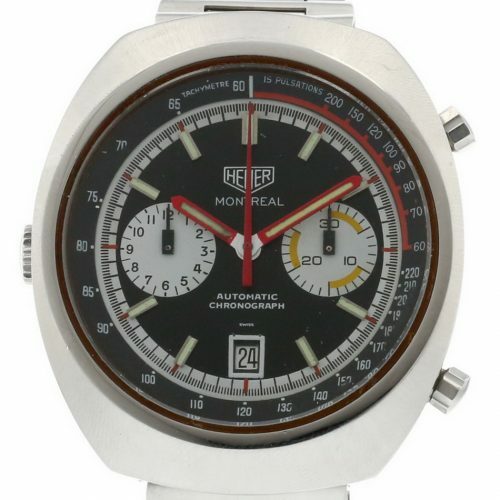 Just in case Heuer hadn’t gone far enough with the design of the Monaco, in 1972 Heuer introduced the Montreal, another Caliber 12 powered chronograph that made the Monaco seem almost tame. The Montreal was a lump of steel, with a starburst brushed finish on the top surface and polished steel side surfaces. The inner bezel has both Tachymeter and Pulsometer scales – in different colors, of course – with a contrasting track separating the dial from this inner bezel. The “Montreal” name captured the futuristic spirit of the World’s Fair, held there in 1968. Items 12, 27 and 79 are the black and blue versions of the Montreal, in stainless steel cases. These models use bright red hands, and a red stripe for the pulsations scale, with yellow stripes on the chronograph minuterecorder. 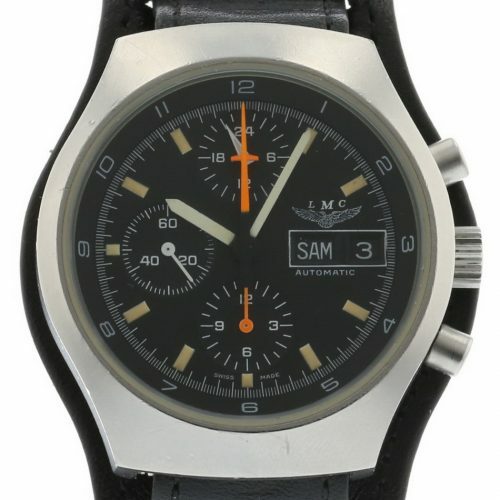 Item 12 is the Montreal with a black dial (Reference 110.503N). Item 27 and Item 79 are both the blue-dialed version, one on a leather strap and the other on the original stainless steel bracelet. 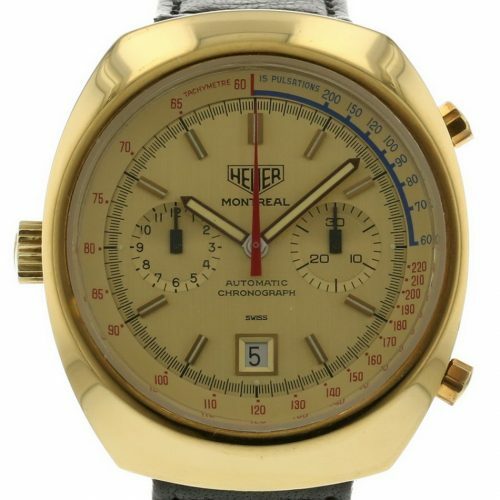 The Montreal may have been Heuer’s most outrageous chronograph, and Item 62 is the most outrageous of the Montreals – with its gold-tone finish and champagne dial. Any of the Montreals will be noticed; this one from a greater distance than the others. 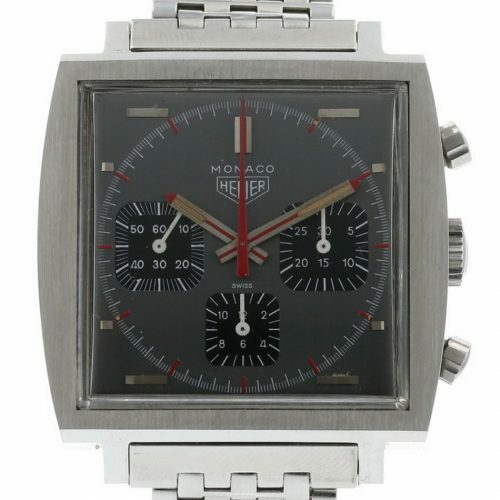 The Monaco was probably Heuer’s most radical chronograph, perhaps the brand’s ultimate example of the round peg placed in the square hole. The edges were razor sharp and the case used a novel construction, with the front of the case and the case-back being held together with interior spring clips. 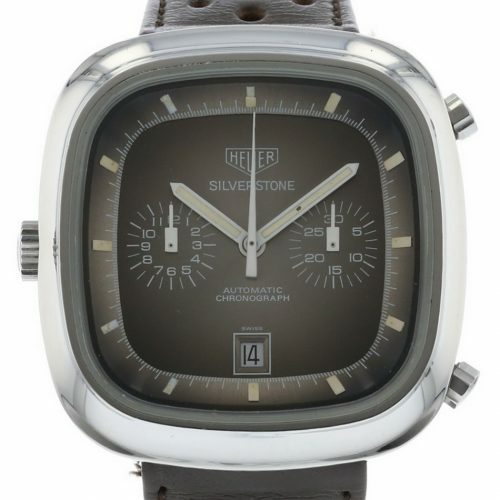 Launched in 1974, the Silverstone may have represented Heuer’s attempt to soften the Monaco, with the corners being rounded and the case utilizing a more traditional screw-back construction. 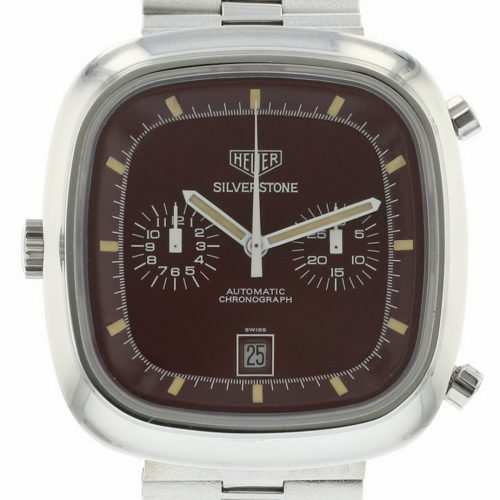 There were three of these Caliber 12 powered Silverstones, with the only differences being the color of the dial and the inner flange. 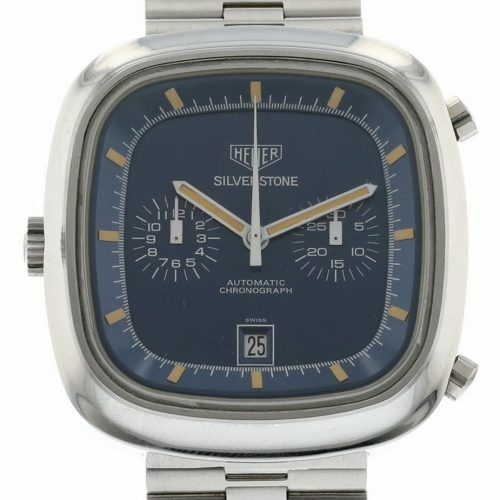 A later version of the Silverstone would have a black dial and be powered by the Lemania 5100 movement. Item 32 is red (or Bordeaux) model of the Silverstone, with a deep gloss finish. Item 34 is the most unusual of the Silverstones, with its “fume” (smoke) finish, that uses a starburst pattern. With different lighting, thefume finish can range from a bright silver to a deep brown. Item 35 is the blue Silverstone, which has a lightly brushed metallic-style finish. This is the version worn by Swiss Formula One hero ClayRegazzoni. 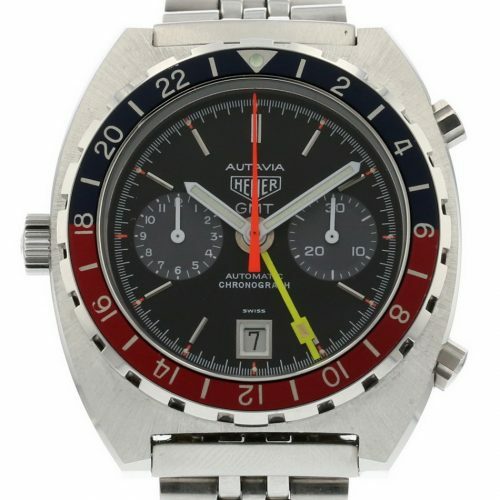 In addition to its “big three” line-up of automatic chronographs (Autavia, Carrera and Monaco), Heuer offered a dazzling variety of colorful automatic chronographs throughout the 1970s. 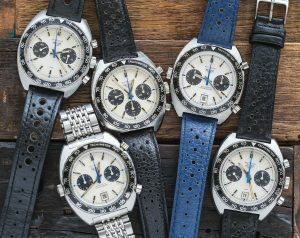 The shapes and sizes reflected the funk of the “Me Decade”, as Heuer created chronographs to suit every taste (or for people with no taste at all)!! 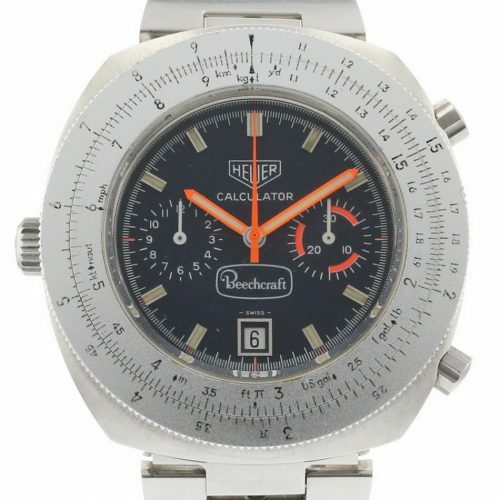 Item 22 is Heuer’s unique Calculator chronograph. At 45 millimeters, this was Heuer’s largest chronograph – it looks big and it wears big. Theexternal bezel is split, with the inner piece remaining fixed in place while the outside part is rotated to perform calculations. 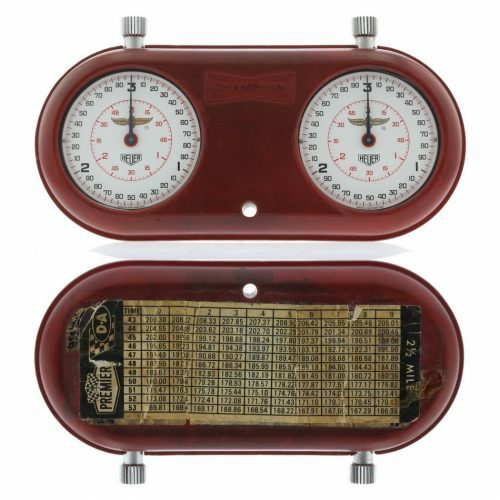 Item 80 is a special version of the Calculator, offered in 1975 by Beechcraft (an American manufacturer of general aviationaircraft) through its network of dealers. The chronographs were offered at the slightly discounted $225 price, with production limited to 500 watches. 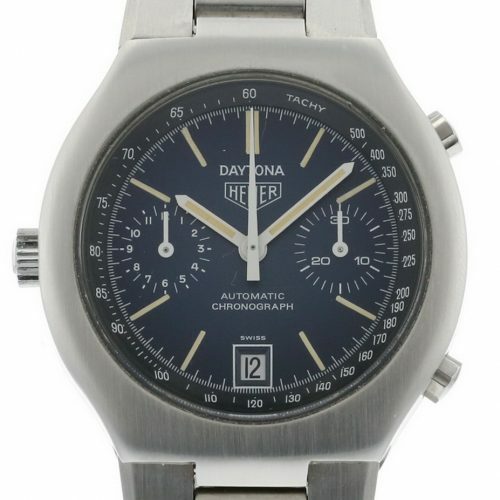 Introduced in 1977, the Daytona (Item 7) was part Heuer’s third generation of Caliber 12 powered chronographs. The Daytona was offered with either amidnight blue or a fume (smoke) dial, always with an integrated bracelet. 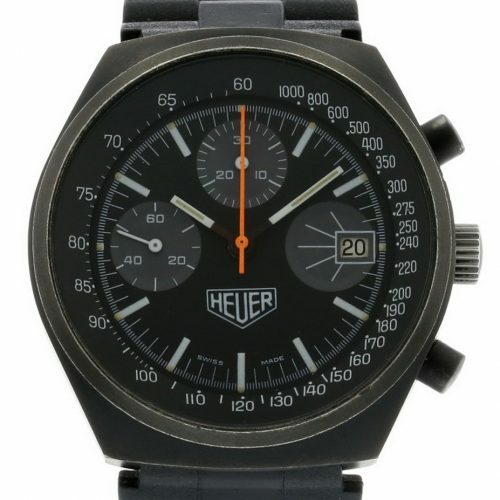 While most of Heuer’s automatic chronographs of the 1970s and 1980s used the Caliber 11 / 12 / 14 / 15 series of movements, Heuer used a variety of other automatic movements toward the end of the 1970s. The movements used by Heuer for these chronographs were two of the workhorses of the Swiss watch industry, the Valjoux 7750 and the Lemania 5100. The Valjoux 7750 has three registers in a 6-9-12 configuration, with running seconds at nine o’clock and the minute and hour recorders, top and bottom. The Lemania 5100 has three registers, with the top one indicating the 24-hour time, the left being running seconds and the bottom register recording the hours. Hands on the center pinion mark the chronograph minutes and seconds. Item 65 is the Pasadena, a black-cased chronograph powered by the Valjoux 7750 movement. 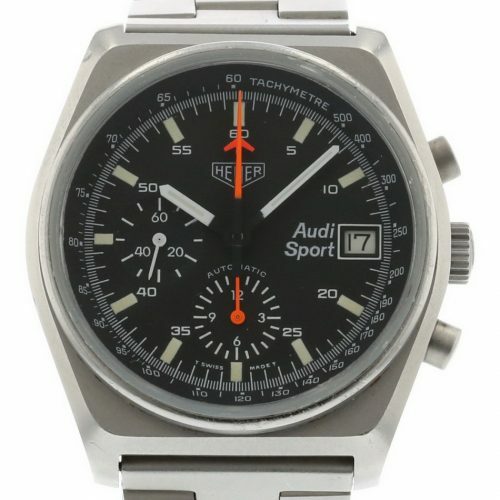 While most Heuer chronographs were named aftermotorsports venues, Heuer used the Pasadena name because of the pleasant sound. 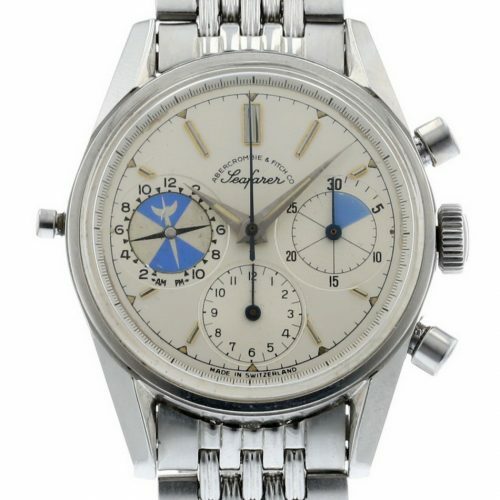 Item 63 is a unique Cortina chronograph, powered by a derivative of the Lemania 5100 movement. 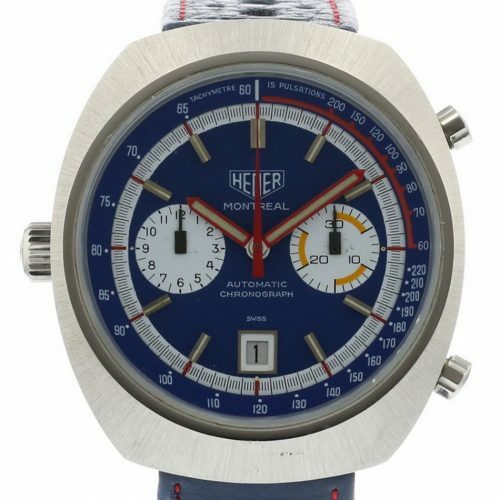 The finish of the metallic blue dial is unique to thismodel, and is complemented by the black registers and orange chronograph hands. Item 81 is a Lemania 5100 powered chronograph, with the Audi Sport logo. These distinctive chronographs were commissioned by Audi Sport U.K. and madeavailable through Audi dealers. 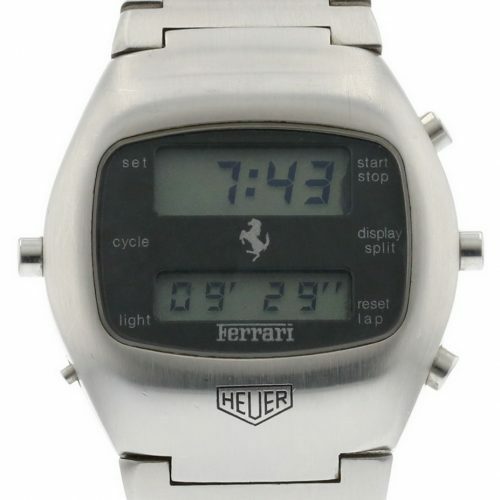 Item 67 is part of the 1000 Series, introduced by Heuer in the early 1980s, with the Lemania 5100 movement. This model has a pewter-coated case, with amatching dial and inner bezel. Orange and black hands, and the soft green lume of the markers give this chronograph a striking look. Item 87 is powered by the Lemanis 5100 movement and offers a distinctive military look. A nearly identical model was commissioned by the Aeronautica Militare Italiana (AMI / Italian Air Force), for use by its pilots. 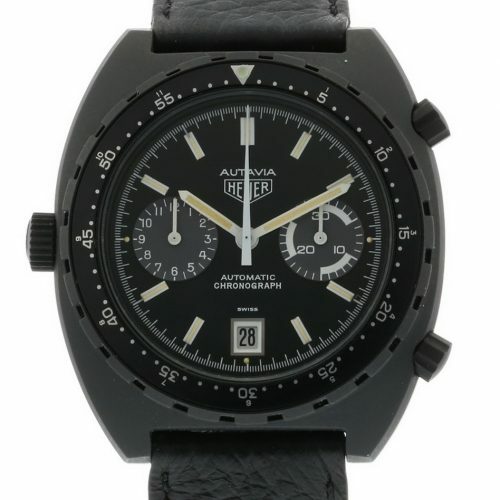 While we have covered the major models of Heuer chronographs above (Autavia, Carrera, Monaco, etc. ), included in the Heuer 100 are several additional watches and chronographs. We have a triple calendar automatic watch from the 1950s, the iconic piItems watch from the 1960s, and four chronographs that capture the unique style of the 1970s. 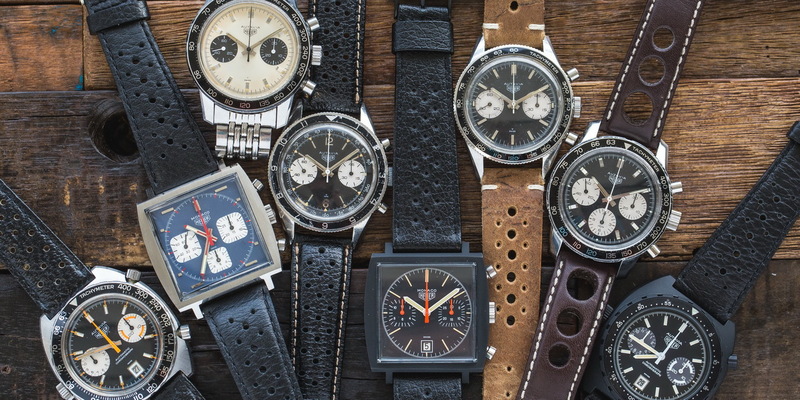 As a decade, the 1970s was different, and Heuer produced some chronographs that showed the originality of the era, using different materials, different looks and different technologies (generally without much commercial success). 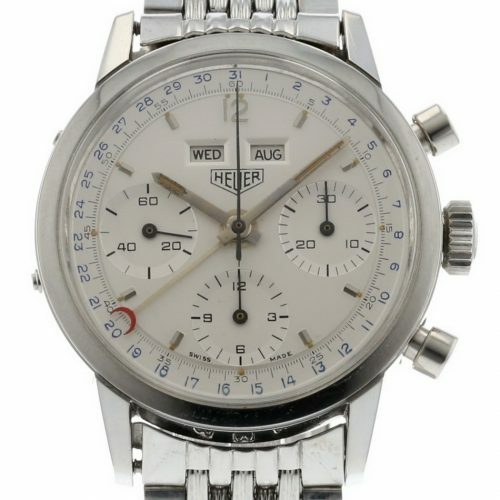 In the 1950s, in addition to its chronographs, Heuer offered a full line of watches, with various complications – for example, watches with alarms or power reserve indicators. Item 29 is an automatic triple-calendar watch from the 1950s (Reference 1806), with a sub-dial for the running seconds. 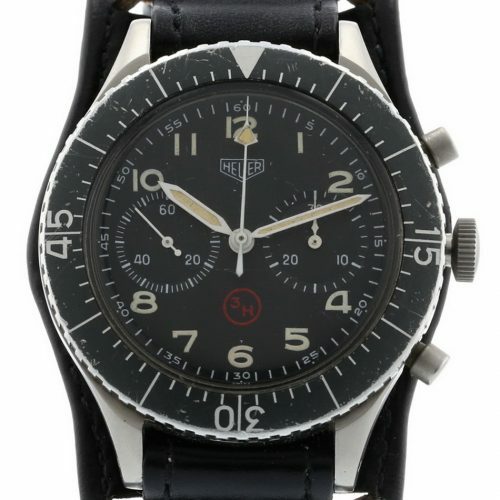 Item 15 is one of the iconic Heuer chronographs, the so-called “Bund”, made by Heuer for the German Air Force(Bundeswehr) in the 1960s. These chronographs (Reference 1550 SG) provide the flyback feature, allowing the piItem to stop, reset and restart the chronograph (at zero), with a single push. 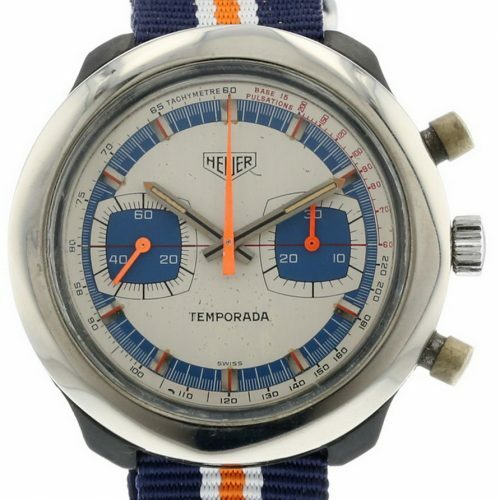 Item 68 is a Temporada, one of the strangest Heuer ever produced. The case is fiberglass, using monocoque construction so that you access the movement byremoving the crystal. Dials were silver, with blue, red or gray accents, and there was also a gold-tone model. Item 66 is a Reference 13-1 chronograph, powered by the Valjoux 7765 movement. While it appears to be a three register chronograph, the “register”at three o’clock merely frames the date window. 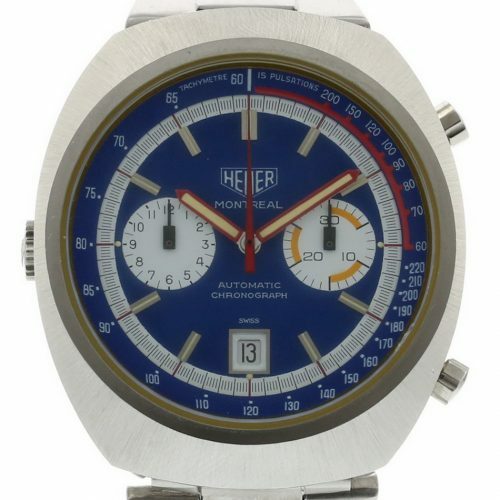 Item 8 is a Reference 1614 chronograph, made for Heuer in France and powered by the Valjoux 7765 movement. This one has the fume (smoke) dial, with theChampion logo across the bottom. The inner tachymeter bezel completes the racing look of this model. 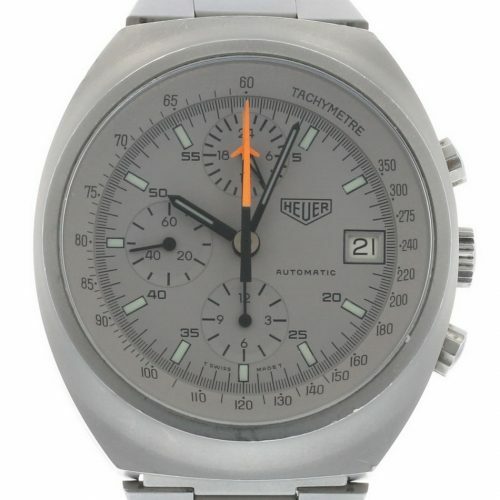 Heuer introduced its line of electronic chronographs in 1975, and this Chronosplit (Item 84) dates from 1977. This version has dualLCD displays, one for the time-of-day and the other for the chronograph functions. Heuer was the official timer for the Ferrari Formula One team in the 1970s, and this Chronosplit has the Prancing Horse logo on the case. 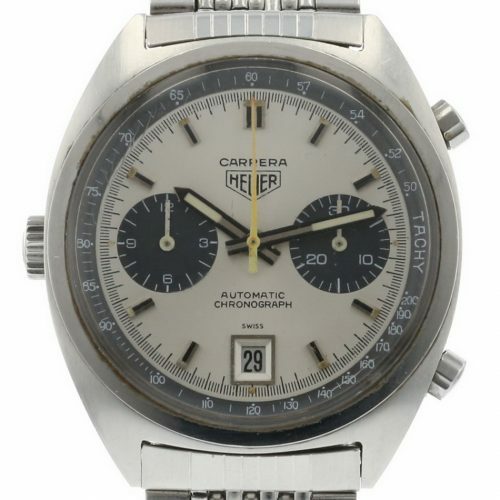 While Heuer sold an Item of chronographs in the 1960s and 1970s, the company’s global market share in stopwatches and dashboard timers was even more impressive. 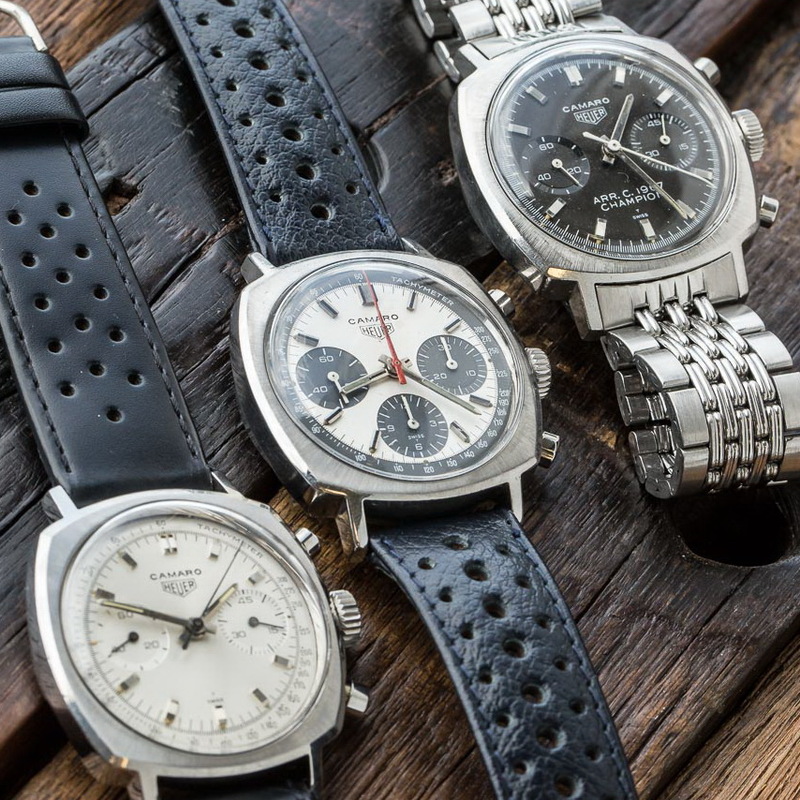 The story is often told that Jack Heuer leveraged the company’s dominant position in stopwatches and racing gear, to break into the chronograph market. Accordingly, it would be wrong to have a sale of 100 Heuer timepieces, without offering some of these other timepieces, that we now think of as accessories. Item 4 and Item 11 are samples of Heuer’s dashboard timers, the choice of rally drivers and navigators from the 1930s through the 1980s. Item 4 is an Auto Rallye, a stopwatch with 60-minute capacity. 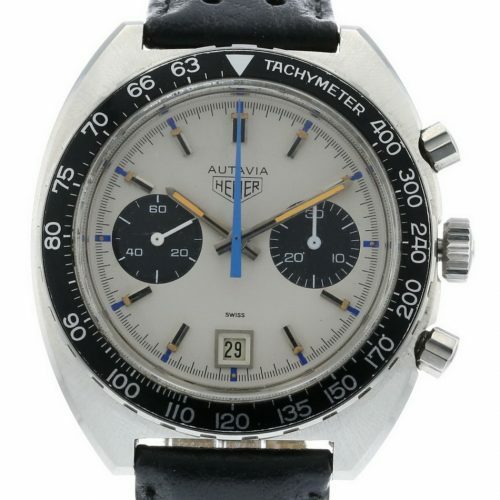 Item 11 is a Super Autavia dashboard chronograph. While many of the dashboard models were limited to specific timing functions (for example, the Master Time was a clock and the Monte Carlo was a 12-hour stopwatch), the Super Autavia was a full chronograph, with the minute recorder at twelve o’clock. Item 86 captures the essence of the Heuer brand. This pair of matching stopwatches indicates the time to 1/100 of a second, with the crown performing threefunctions – start, stop and reset. 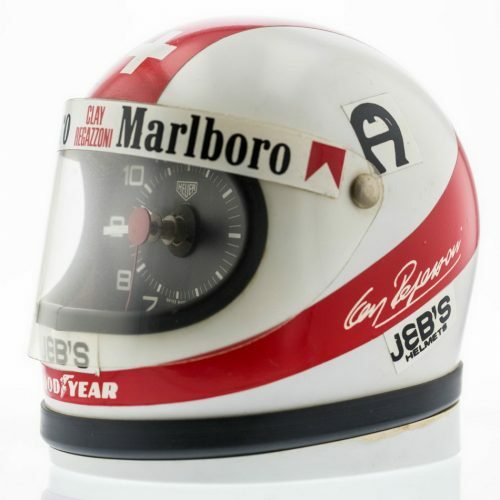 The red rubber holder was issued by Champion, a brand long associated with motorsports and Heuer, and the sticker on the back converts the elapsed time at the Indianapolis Motor Speedway into miles per hour. 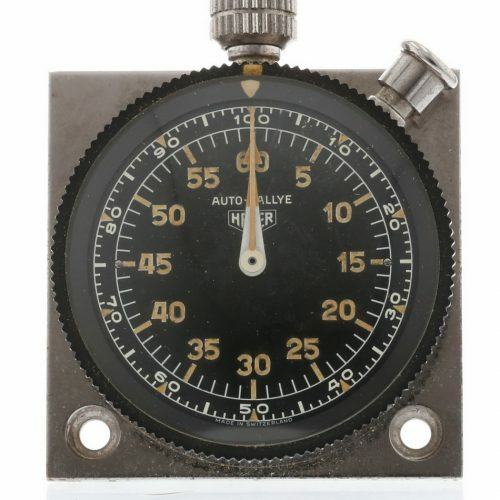 While the provenance of this pair of stopwatches is not known, we can safely assume that these stopwatches timed some laps of the Indianapolis 500, in the mid-1960s. 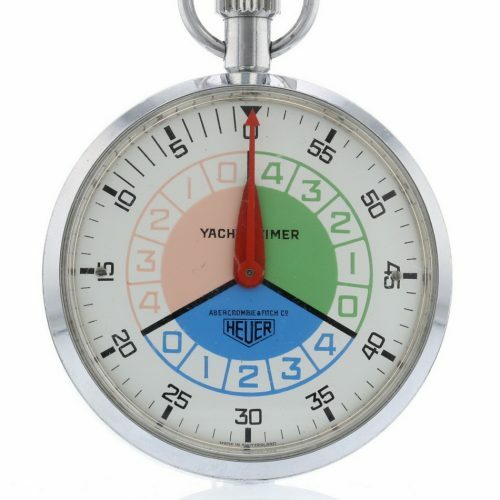 Item 93 is a colorful Yacht Timer, made by Heuer for Abercrombie & Fitch. This is a 15-minute countdown timer, allowing the yacht racer to time theapproach to the start line, with the three five-minute sections of the dial corresponding to the horns sounded before the beginning of the race. This stopwatches also brings together three aspects of Heuer’s history — its dominance in stopwatches for sports, the brand’s collaboration with Abercrombie & Fitch, and its connection to yacht racing and other water sports. 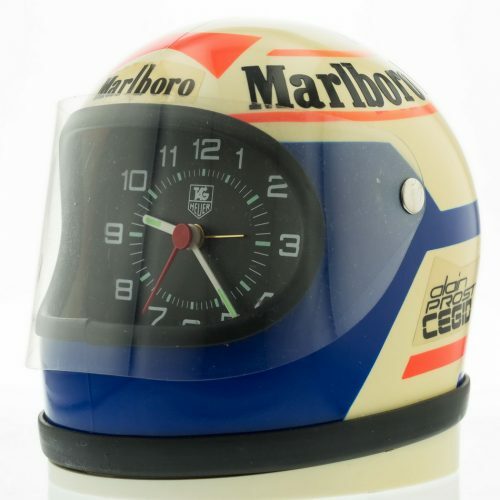 In the late 1970s, Heuer offered a series of desk clocks, in miniature racing helmets. 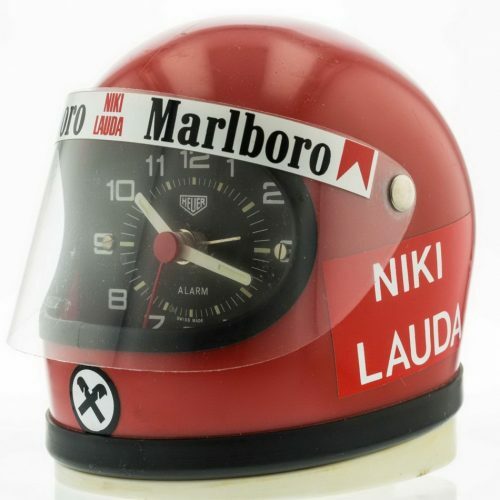 Items 1, 2, 3, and 71 are the helmets for Clay Regazzoni, James Hunt, Niki Lauda, and Alain Prost, respectively. 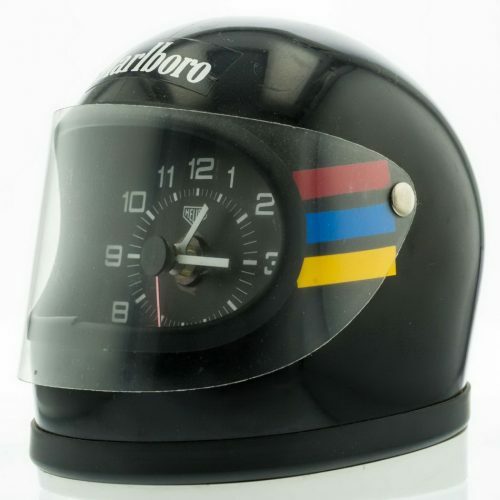 These helmet clocks are described inHeuer’s 1977 catalog. Heuer catalogs from the 1950s through the 1970s offered a huge array of timing devices, for science, industry, and sports. There were timers specifically for skydivers, for rows and even for conductors. 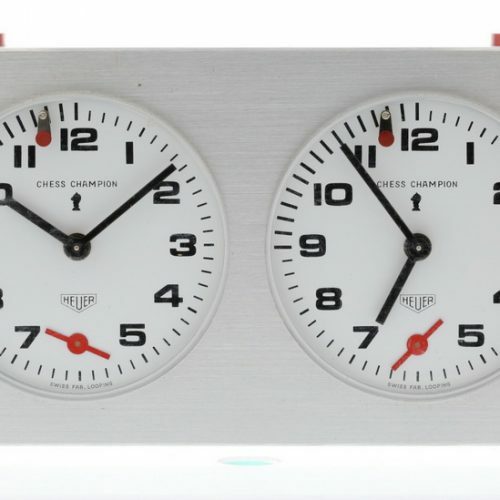 To time chessmatches, Heuer offered the “Chess Champion’ (Item 98), which was admired among top chess competitors for its quiet but reliable operation. With the next World Championship coming to New York City in November 2016, this is the perfect Heuer timepiece to connect with the event.